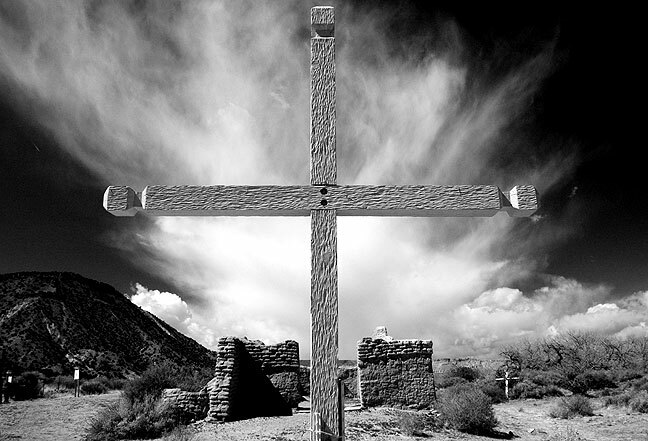 I thought this image made at the Santa Rosa de Lima Church Ruins in north central New Mexico to possibly be the strongest piece of the week, so I save it for last. The light, sky, and composition summon recollections of some of the best photography from throughout the history of New Mexico. 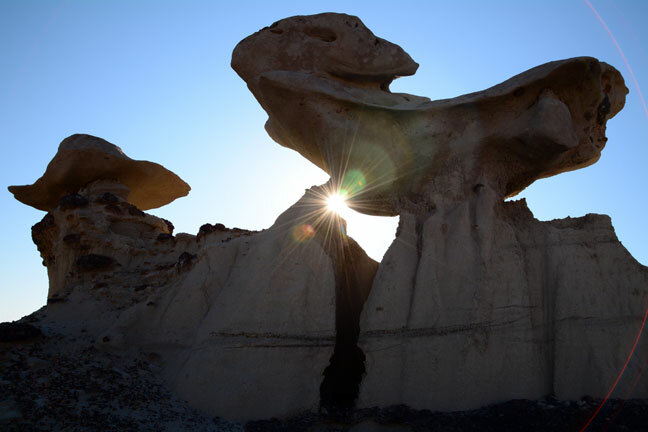 Morning sunshine streams through hoodoos at northwestern New Mexico’s Bisti Wilderness. 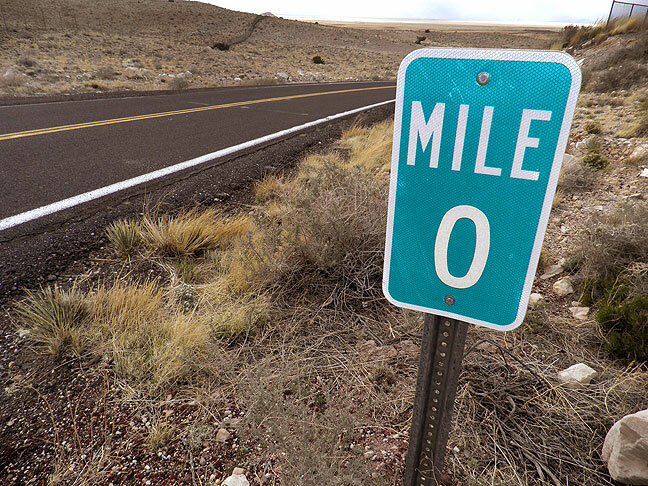 Mile Marker Zero: the start of great things. 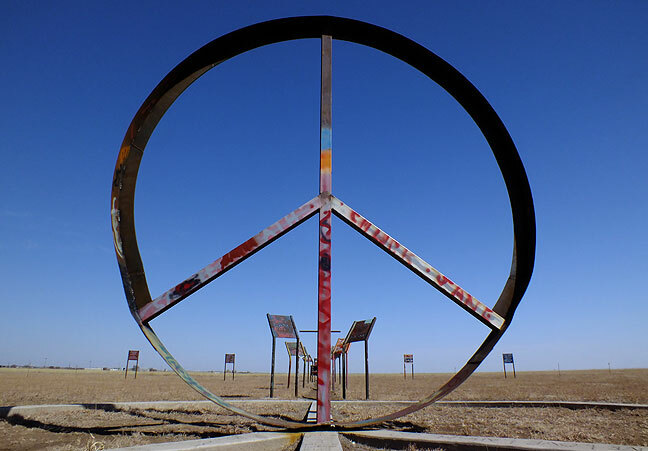 Early in my drive I spotted a “peace park” sculpture garden near the rest stops at mile marker 87 on I-40 in the Texas panhandle. There were no signs explaining what it was or who created it, but it made decent pictures. I timed my drive from Oklahoma so I would be in Canyon, Texas for The Unholy Trinity Tour, an atheist lecture event. It went well, and I made just a few images with my point-and-shoot. I was back on the road by 4 p.m. Near the New Mexico border I saw a semi fully engulfed in flames in the eastbound lane, but the traffic situation prevented me from photographing it. Traffic behind it appeared to be stopped for at least five miles. 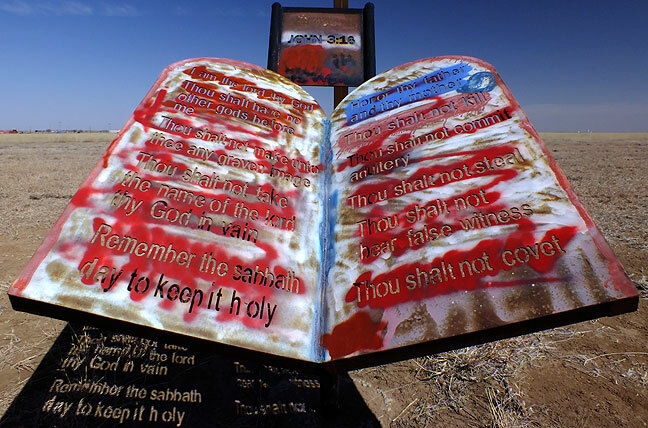 It was oddly thought-provoking that in the lobby at my motel in Moriarty, I overheard a woman say, “This country is based on God. In God we trust.” After the atheist confab hours earlier, I was tempted to challenge her, but thought better of it. The actual peace sign in the peace park was about 12 feet tall. 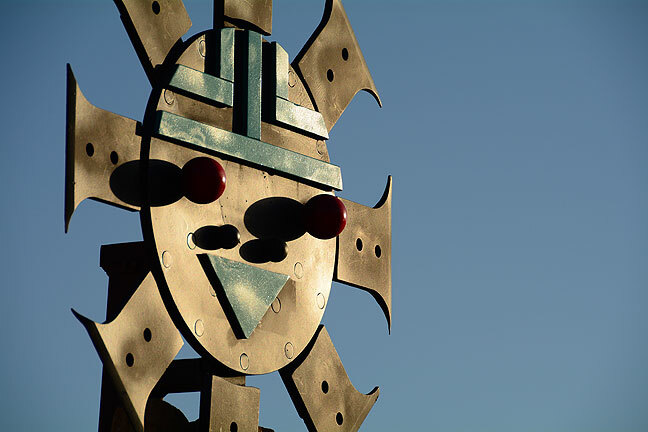 This sculpture sits at the curve in the road in the middle of Madrid, New Mexico. I was out the door full of breakfast at 6:30 a.m. It was very cold and cloudy. I drove west then north via New Mexico 14, which is part of the Turquoise Trail. My first stop was at a roadside business with side-by-side signs that read “Come in…” and “No Trespassing.” I photographed it from the road. My next stop was Madrid, which I visited in 2001 and in 1990. 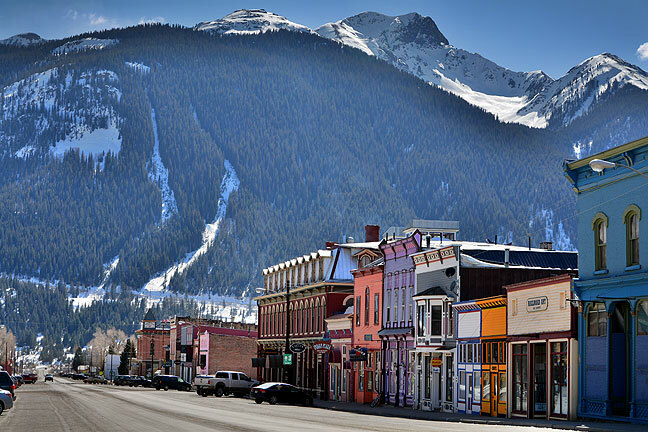 The town is nestled in a narrow valley like a lot of mining or skiing towns. The entirety of the center street is shops, galleries and attractions. I was there quite early in the morning, so nothing was open, but I made lots of images. The only other people I saw were two women walking their dogs. 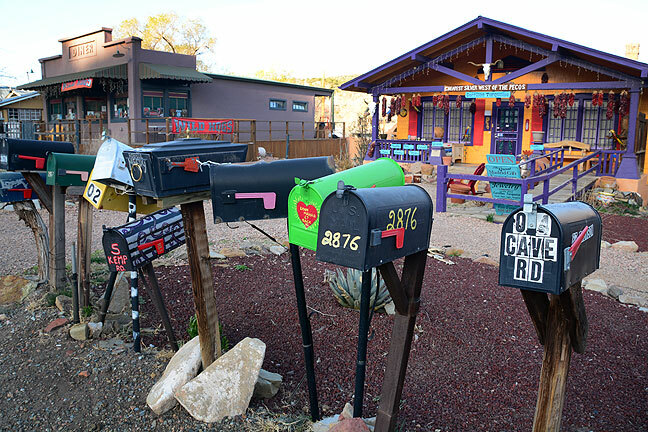 Since Madrid, New Mexico is set in a narrow valley, all the mailboxes are on the highway through town. 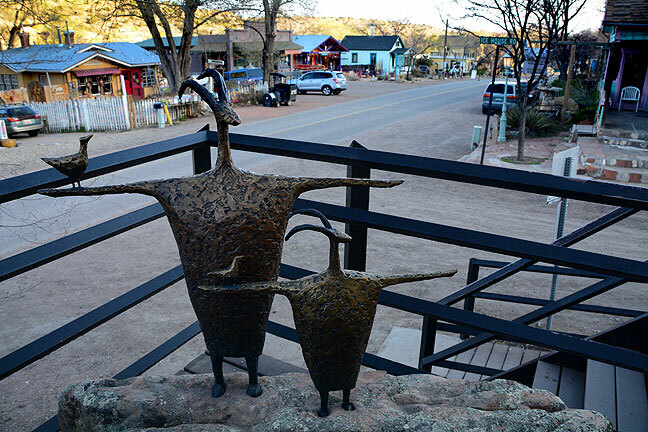 Since much of Madrid, New Mexico is based on the artistic community attracting tourism, statues like this abound. 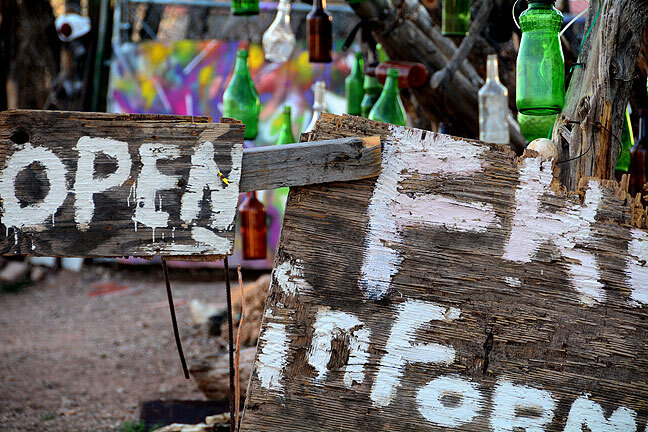 Hand-painted signs, hundreds of bottles, and the signs “Come in” and “No Trespassing” adorned this roadside photo op on New Mexico 14. Morning on Interstate 40 reminds us that America never really sleeps. Morning light shines on an empty street in Los Cerillos, New Mexico. Moments after I made this image, I greeted a nun, who frowned at me and walked away. Down the road in Cerillos, I photographed the same Mission steeple I photographed in 1990. The light was very different, and the church did a good job of taking care of it all these years. 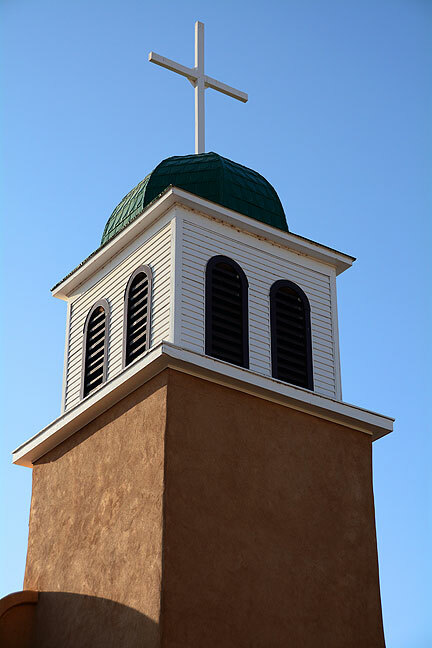 The steeple at the mission in Los Cerillos, New Mexico, looks like it has been well-maintained. I photographed it once before, in 1990. By 10 a.m., I was at one of my goals for the day, Plaza Blanca. Situated on the private property of a mosque, it has been used for filming or several Hollywood movies over the years. In fact, I got the idea to find it and hike it after Abby and I saw it in a recent movie on Netflix. The formations were bigger that I expected, but the area was smaller than I expected. Blue sky, cold morning air. 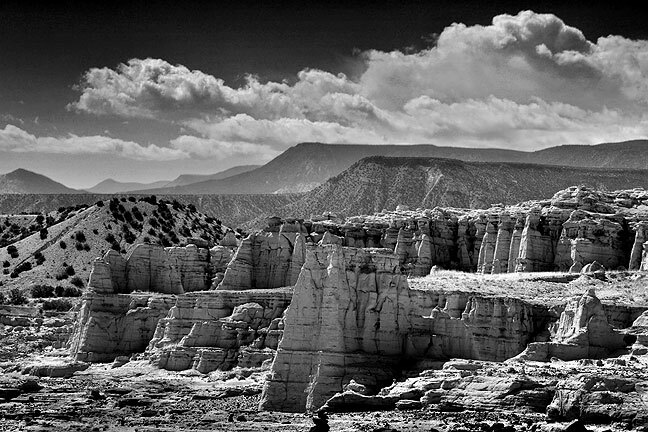 I thought this image, a black-and-white rendering of Plaza Blanca in north central New Mexico, had a very Ansel Adams look to it. 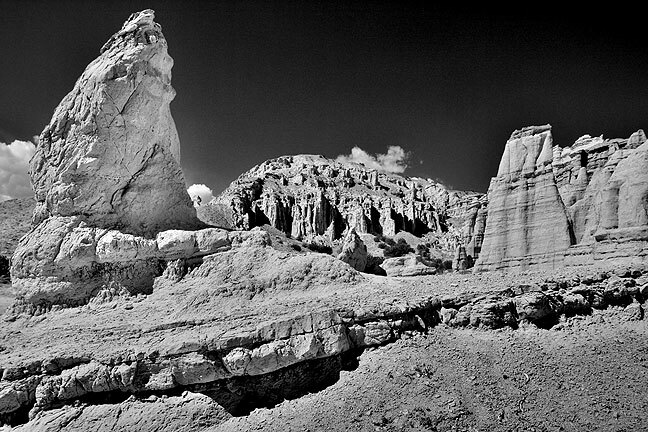 As I had anticipated, Plaza Blanca ended up being a black-and-white imaging opportunity. 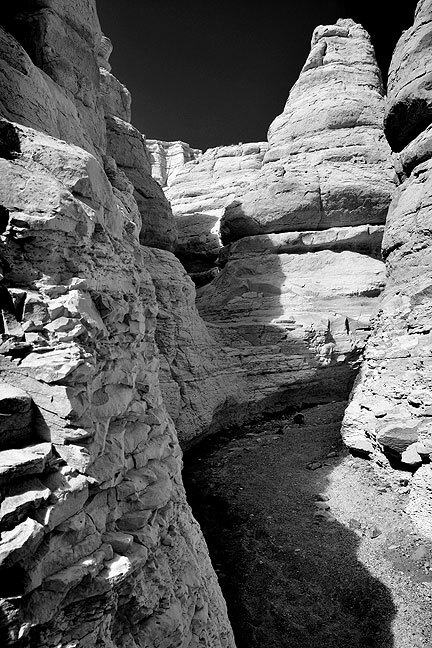 I made this image near the top of the drainage that forms Plaza Blanca in north central New Mexico. At 12:20 I found Santa Rosa de Lima church ruins, which Abby and I had seen but not photographed in 2005. Excellent cross-against-the-sky image. By 1:15 I was at the storied Ghost Ranch. I briefly took the Matrimonial Mesa hike. The Chimney Rock hike ended up being the best of the day. 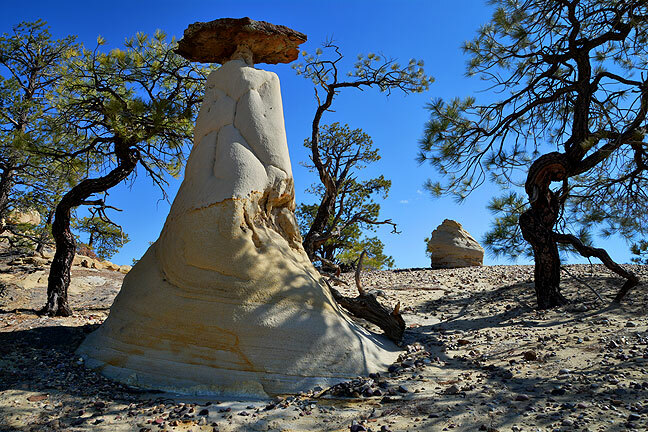 It is a three-mile round trip hike that ascends to one of the area’s signature formations, the Chimney Rock itself, with excellent views on the way. At the top, fierce wind fought my imaging efforts, but I ended up with something I liked. 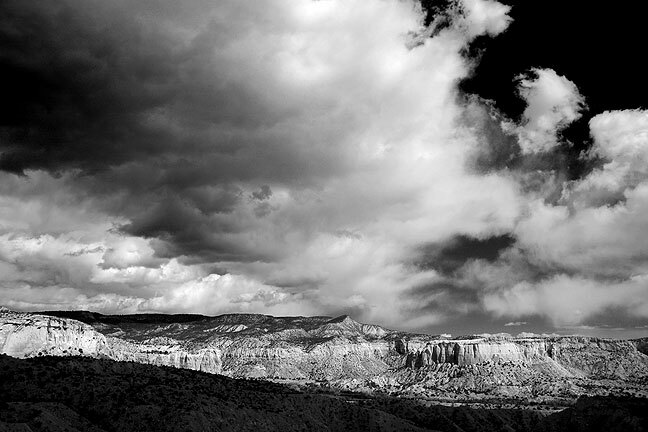 The Sentinel, right, looms over the south entry to the Chama Valley in Northern New Mexico. I photographed this formation in 1999. 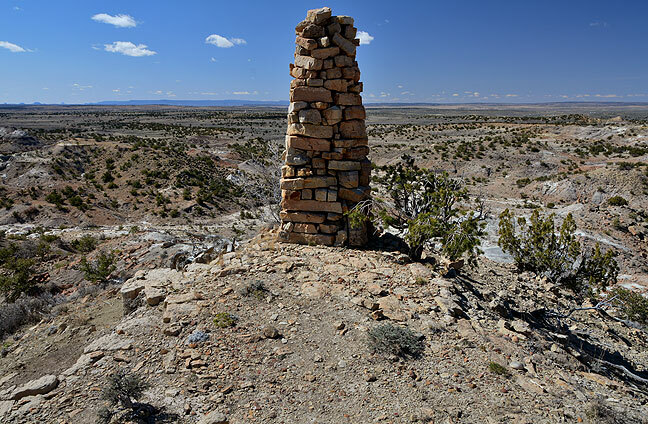 Chimney Rock at Ghost Ranch is visible on the left from the Chimney Rock trailhead. 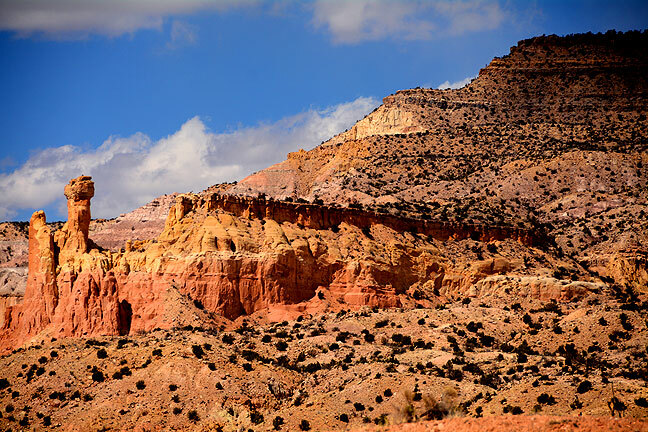 This close-up view of Chimney Rock awaits at the end of a moderately strenuous hike through the heart of the Ghost Ranch landscape. The moody skies and lands of northern New Mexico never cease to amaze, and seeing them again reminds me why artists like Georgia O’Keeffe lived and worked here. 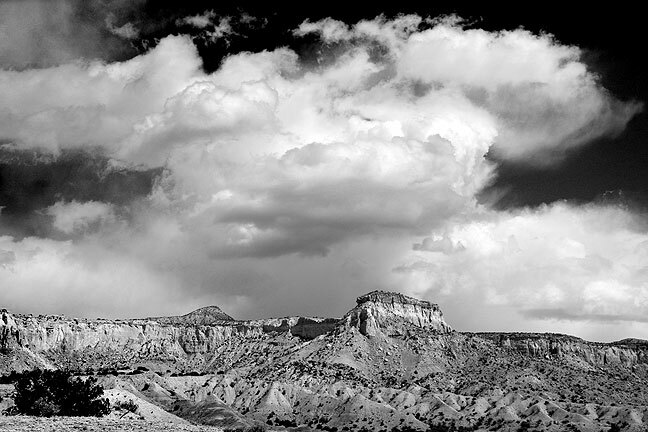 I made this archetypically moody image on the Chimney Rock trail at New Mexico’s famous Ghost Ranch. 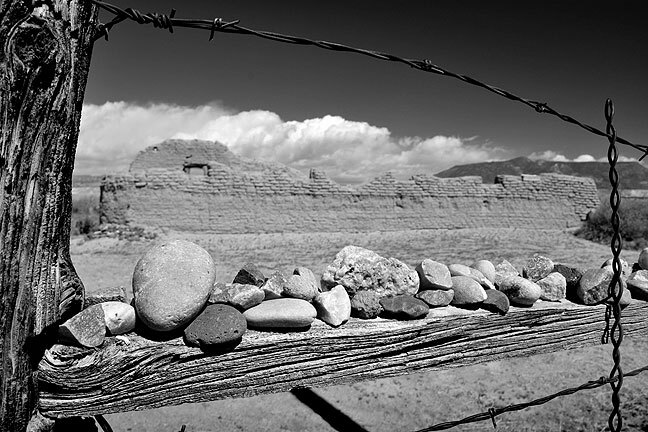 Stones adorn the gate at the Santa Rosa de Lima Church ruins north of Española, New Mexico. I got up before dawn and hit the road. 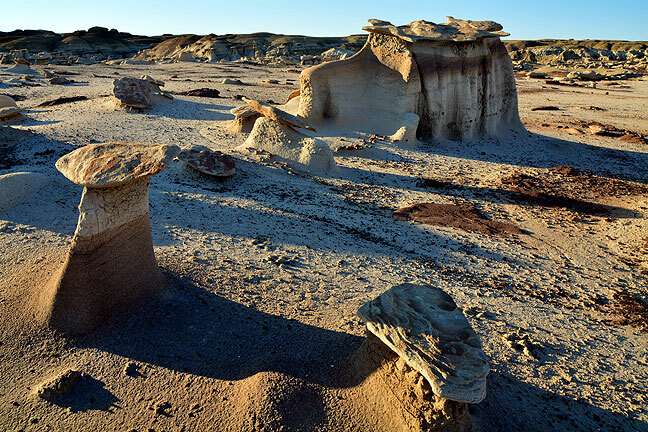 I was at the Bisti Wilderness, which is about 35 miles south of Farmington on 371, just at sunrise. It was very cold and clear. 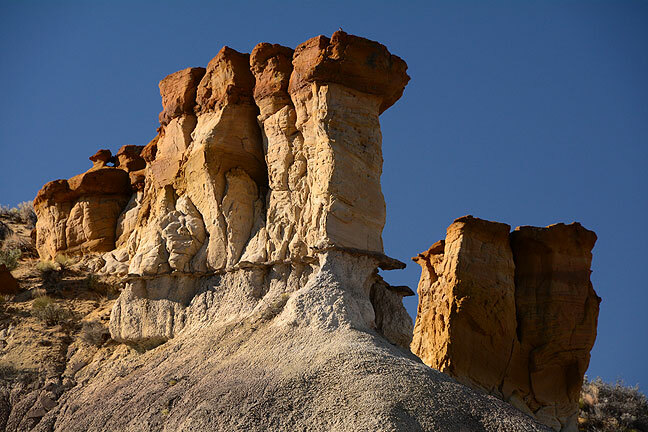 I made my way up the wash to the east-northeast, marking spots on my GPS and photographing various formations as I went, including Hoodoo Field 1 and The Wall. I was looking for a famous formation in the area alternately called “The Cracked Eggs,” “The Alien Eggs,” “The Alien Hatchery,” and others. By about the four-mile mark, I decided that I had missed the formation, so I returned on a slightly more southern track and found it. It was smaller than I remembered from my short visit to it in 2009, but it made fairly decent images. 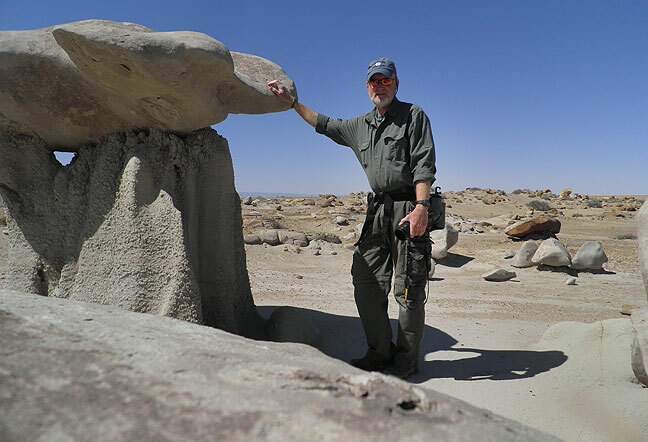 Your host poses for a selfie at “The Peak” in the north section of the Bisti Wilderness. Continuing to move southwest toward the trailhead, I saw a plume of black smoke, and became slightly anxious that it might be my own car on fire, since there was nothing else there. Of course, it wasn’t my car, but I never found the source of the smoke. 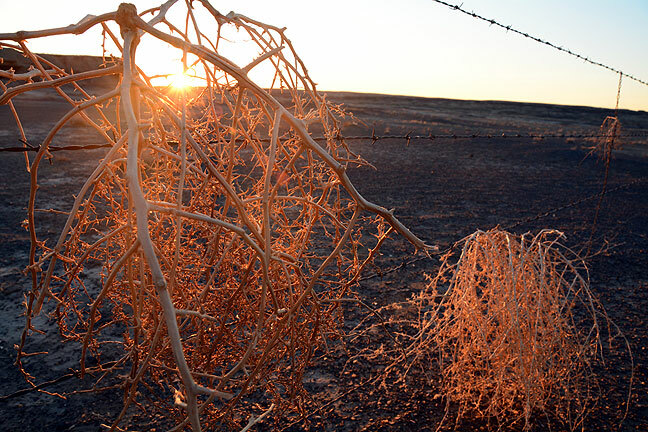 Tumbleweeds cling to a barbed wire fence at the Bisti trail head at first light. 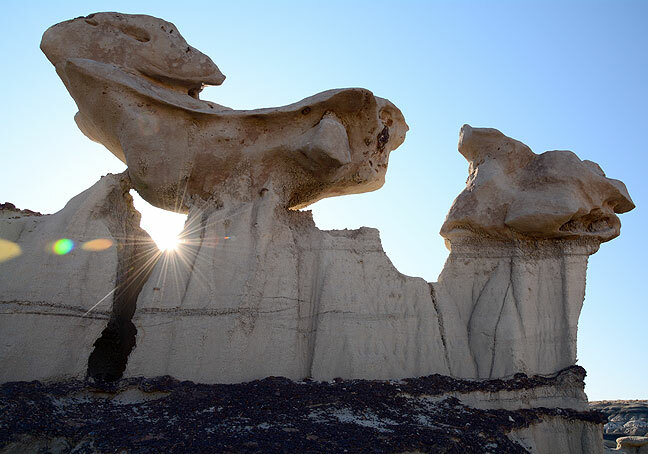 Morning light shines on a hoodoo field at the Bisti Wilderness. 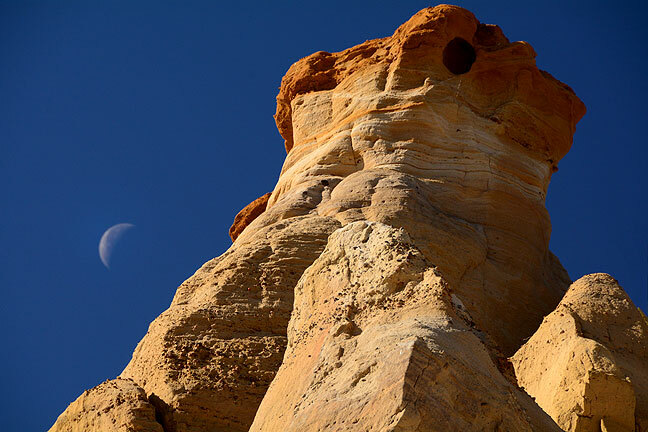 Early in my hike at Bisti I had excellent early light and pure blue skies. 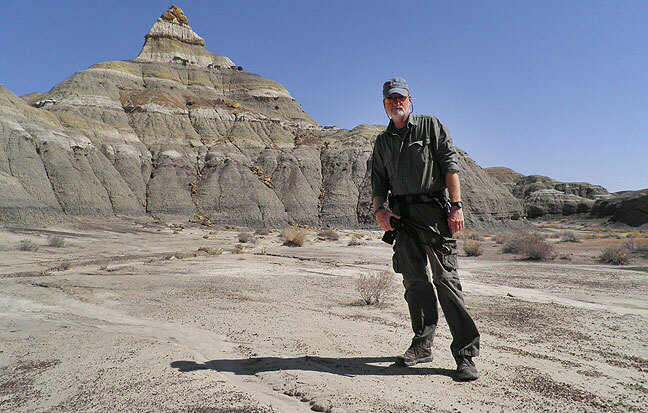 Here is another “propped up with my gloves” self portrait at Bisti to establish a sense of scale. 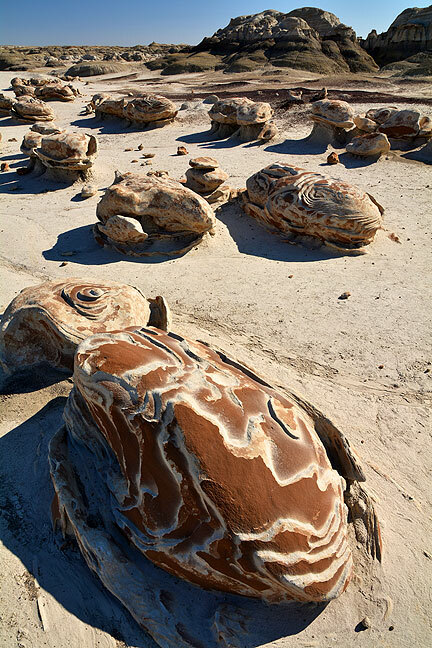 The complexity of the alien landscapes of Bisti never ceases to intrigue me. 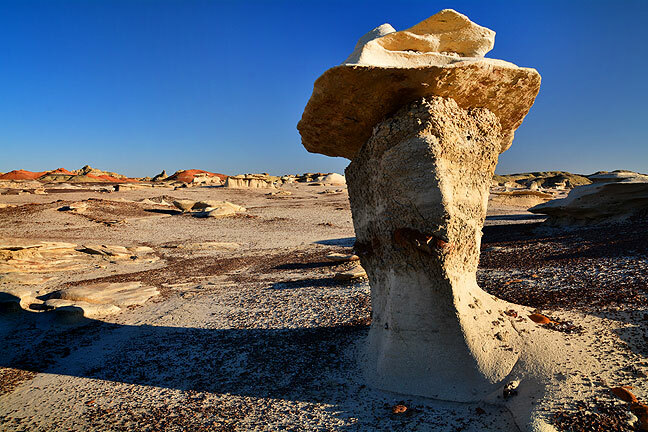 The purity of the light, particularly in the morning I visited Bisti, was without peer. 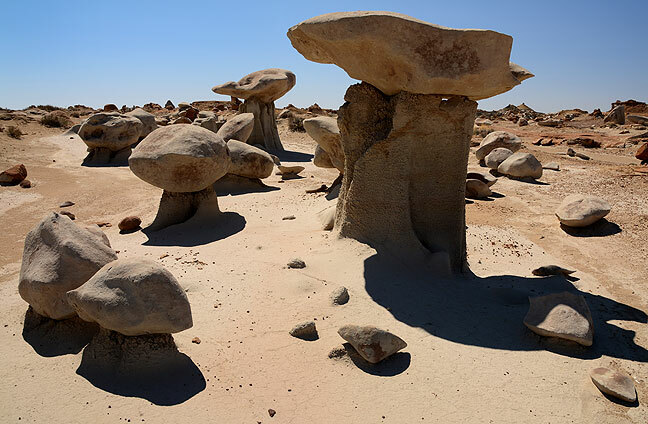 Iron-rich, pebble-sized stones cling to the ground near Bisti’s Alamo Wash.
My afternoon hike at Bisti took me through more hoodoo fields, like this one near the western boundary fence. 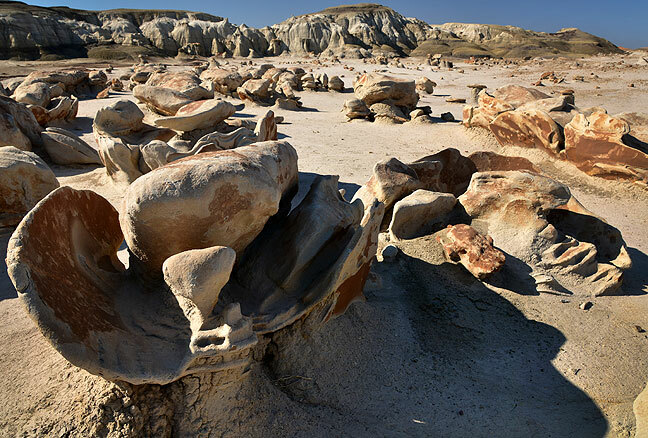 The Bisti/De-Na-Zin complex is 45,000 acres. In spite of three visits, I feel I have only scratched the surface, and I will likely return. 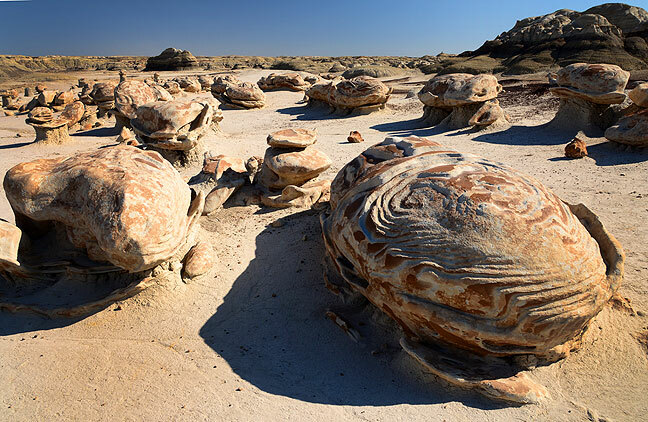 The so-called “Cracked Eggs” formation at Bisti is the center of a lot of photographic attention. This is another view of the “Cracked Eggs.” In 2009, I found this feature when I walked over to say hello to two photographers who happened to be shooting it. 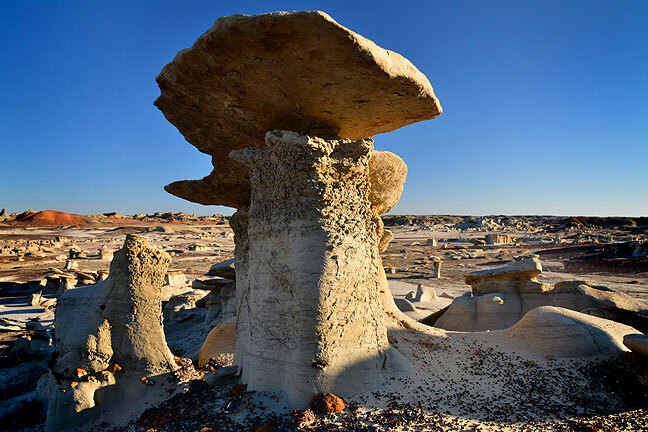 The Bisti Wilderness is complex, elegantly beautiful, and constantly changing, like this hoodoo field shot in crisp morning light. 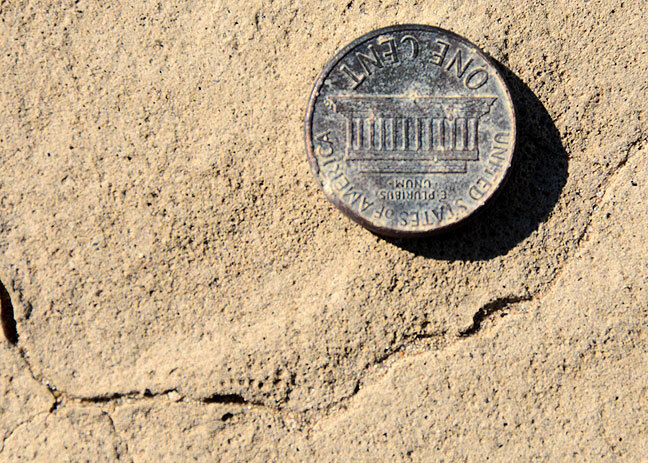 Deep into the labyrinth of the Bisti Wilderness, not having seen another human being or even spoken a word aloud in hours, I looked down to see this penny. 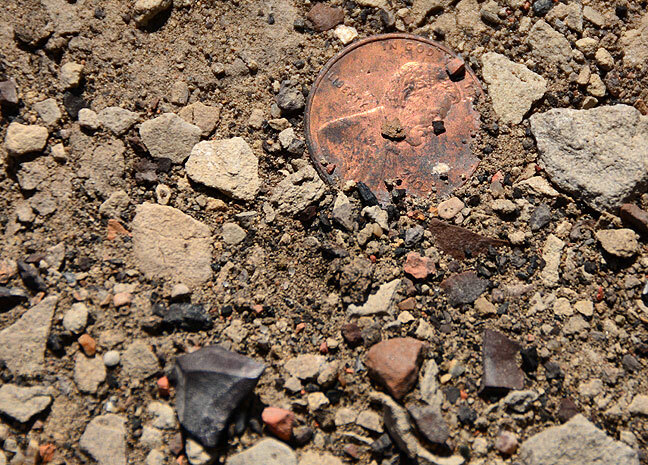 In the parking lot of the Bisti Wilderness, as I was silently making lunch without another human being anywhere in sight, I looked down to see this penny. It rained not long before my visit. There were puddles on the road to the trailhead, and the sand in the wash showed moisture just below the surface. At midday, I used my JetBoil to make coffee and prepare some dehydrated pasta primavera, both of which were pretty good as camp food goes, and the JetBoil worked very well. After lunch, I struck out again, this time to the north. I followed the boundary fence to a few interesting hoodoo fields, The Peak, The Boulder Wash, and a bottomless pit carved out of the wash. 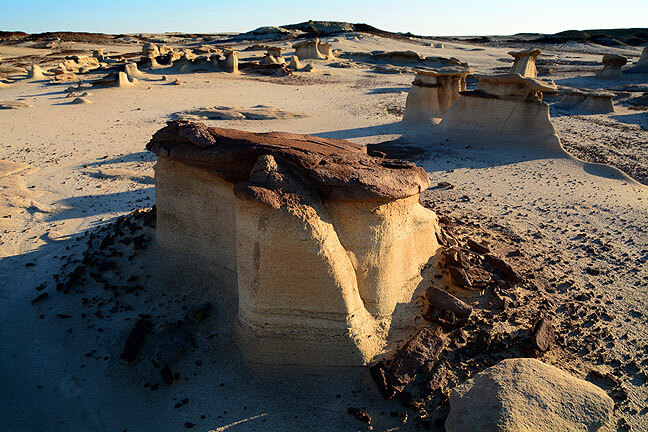 There were many tracks, both human and horse, in this section of Bisti. Morning light illuminates an area I named “Hoodoo 1” on my GPS. The day stayed sunny and cool, and I accomplished my photographic and hiking goals. 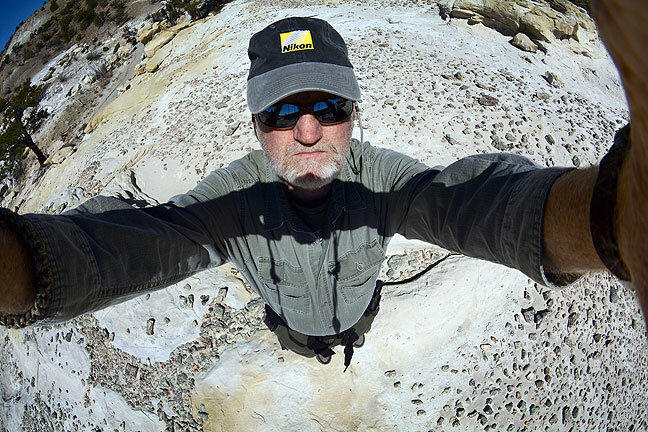 Using my gloves wadded up on a hoodoo in lieu of a tripod, I made this self-portrait on my morning hike at Bisti. This trailhead sign at the De-Na-Zin Wilderness is weathered, and faces the road, so it’s easy to miss. 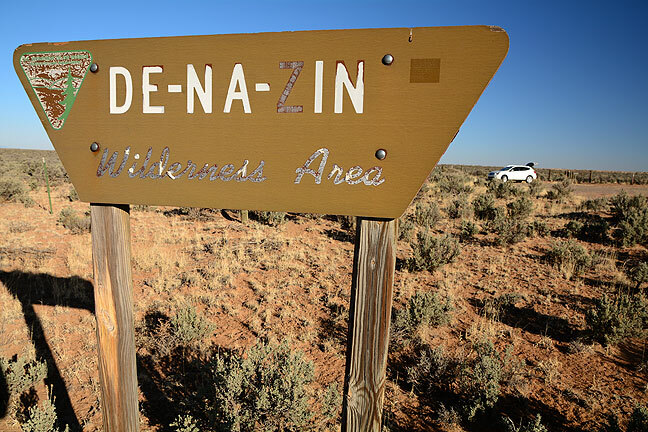 Up early again, I found the trailhead at the De Na Zin Wilderness, which is the northeastern portion of the greater Bisti/De Na Zin Wilderness, after driving past it once, then doubling back. I missed it the first time because the sign is back from the road and faces it instead of facing traffic. 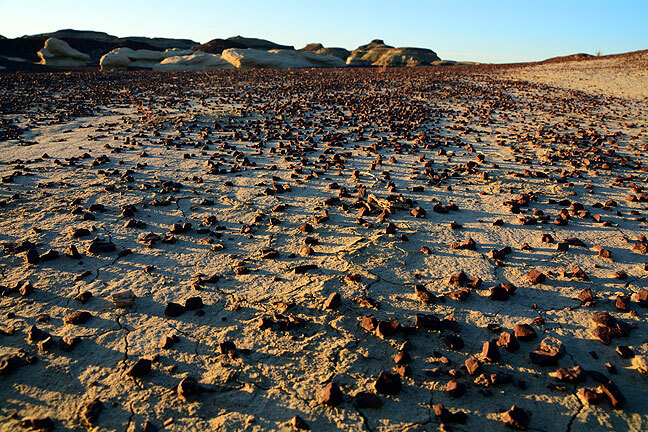 The De-Na-Zin Wilderness is the northeastern section of the greater Bisti/De-Na-Zin complex. It is much larger, and I don’t feel like I devoted the time and energy it probably deserved. 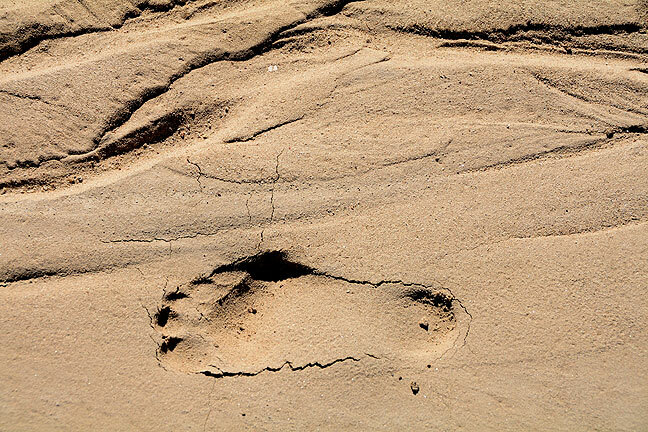 Possibly the most interesting thing about the De-Na-Zin Wilderness was tracking the wildlife, including this set of tracks. 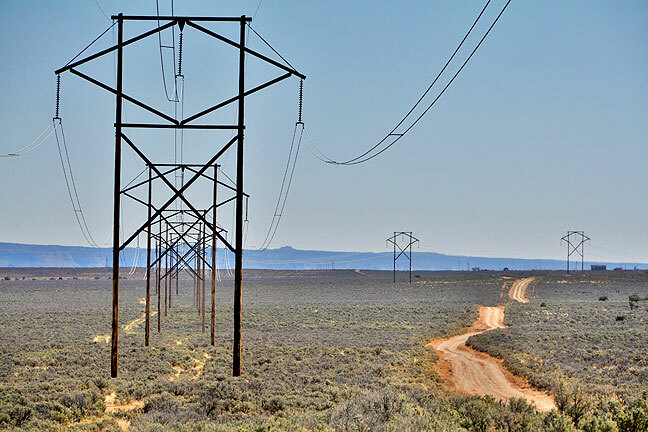 A road and power lines lead into the distance near the De-Na-Zin Wilderness. 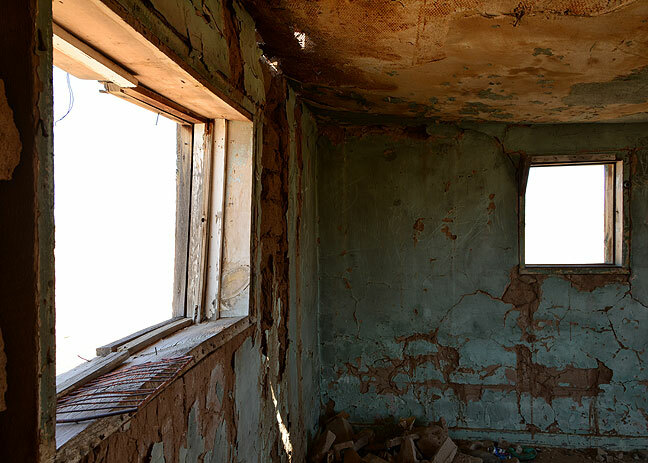 I photographed this abandoned building at Blanco Trading Post, New Mexico. There’s not much else there, so as far as I know, this might have been the Blanco Trading Post. 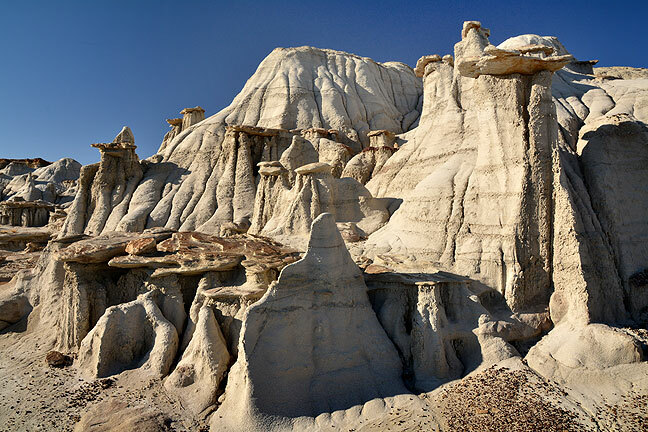 I hiked well, but found the area less interesting than Bisti. It was a beautiful day, though, and I very much enjoyed being far from the world. At one point I heard a coyote howl at me from his lair less than 50 yards from me. Coming north from De-Na-Zin, I stopped and photographed an abandoned building at Blanco Trading Post which, as far as I know, was the trading post. 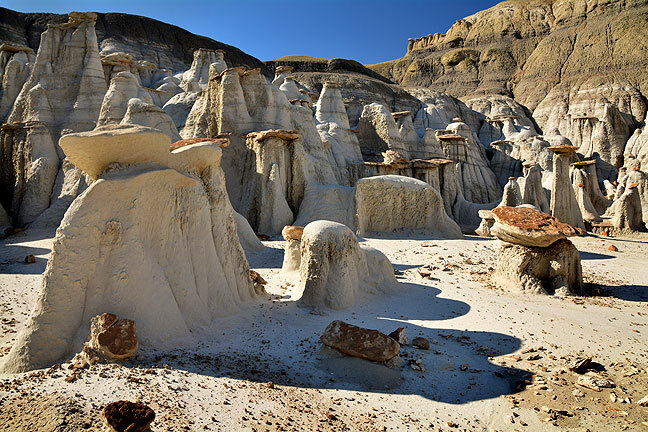 The De-Na-Zin Wilderness wasn’t as interesting as Bisti. This was the strongest piece from the hike. 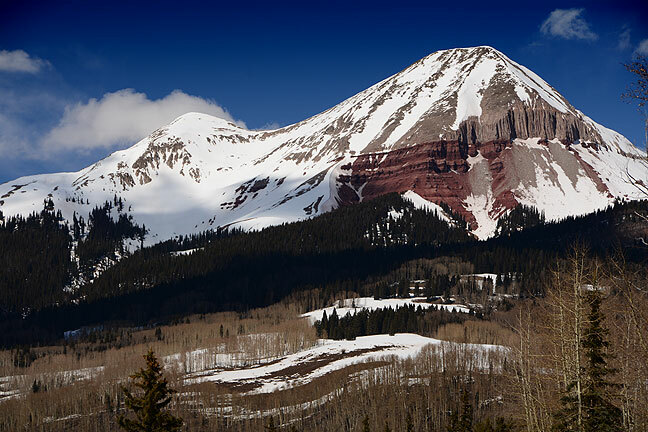 Beautiful deep blue skies perfectly framed the San Juan Mountains as I drove north to Silverton, Colorado. 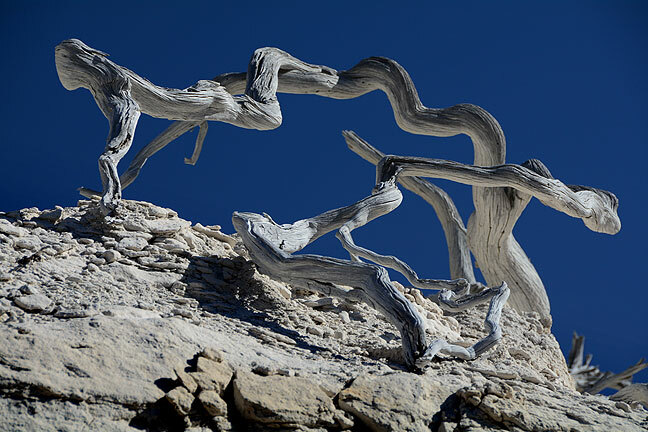 I shot well, and thought often of the work of Ansel Adams in these same places years ago. 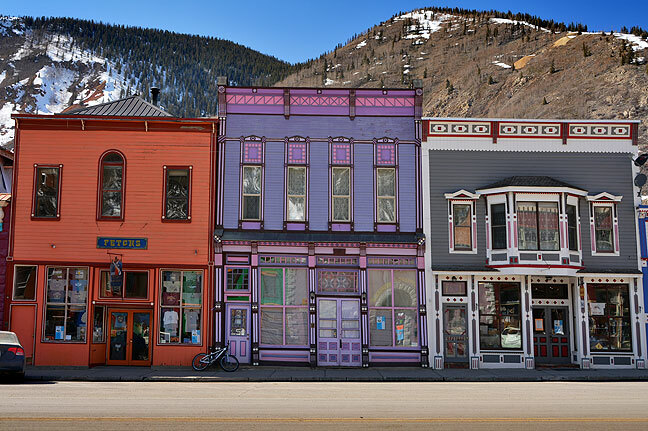 State Highway 110 forms the main street in Silverton, Colorado, which is quiet and colorful, and surrounded by exceptional natural beauty. The San Juan Mountains beckoned, so I headed north. 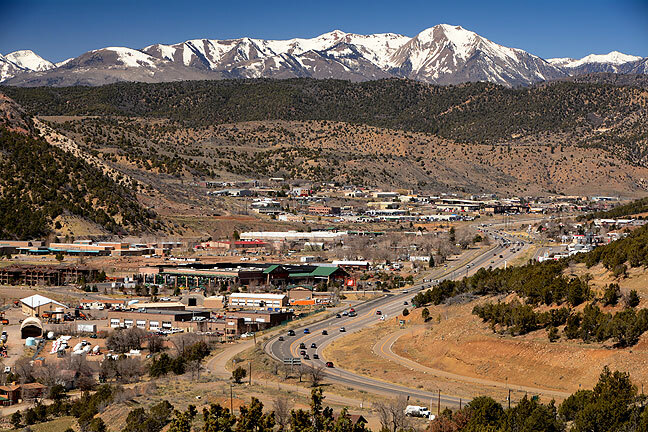 My first stop was Durango, Colorado. 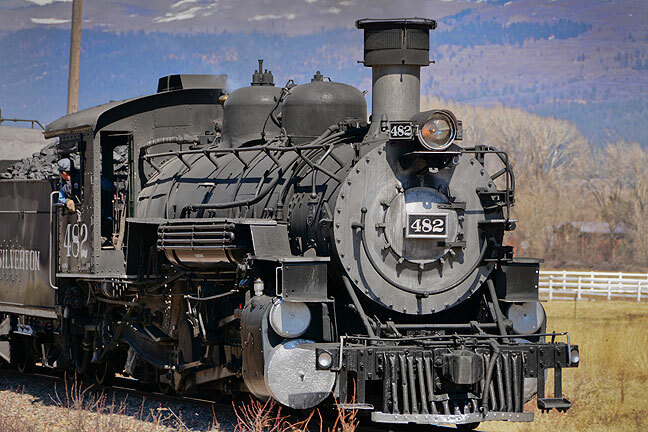 North of Durango, I spotted this train, the Durango and Silverton Narrow Gauge Railway, chugging south. After I photographed it, it roared past, and the smell from the coal-burning steam engine was quite foul. 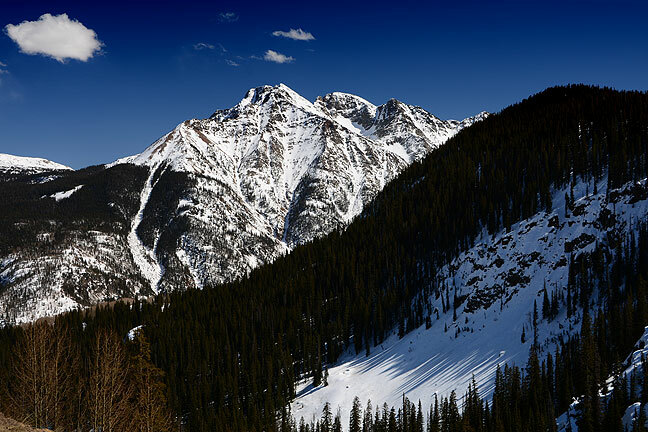 In 1990 Scott, Lisa, Robert and I skied at this mountain, which was called Purgatory at the time. It has since been renamed Durango Mountain Resort. 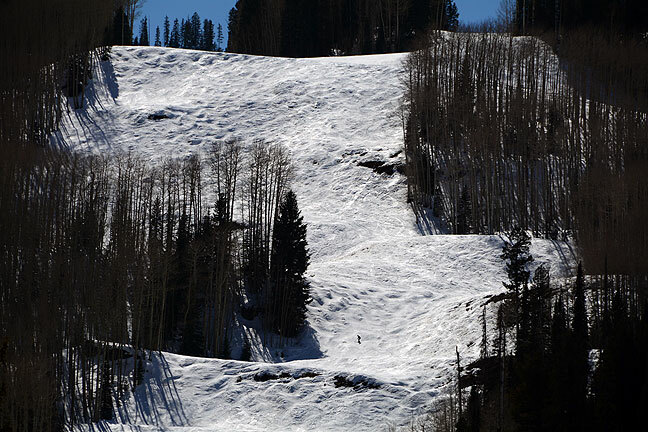 Being late in the season, you can see just one skier in this image. 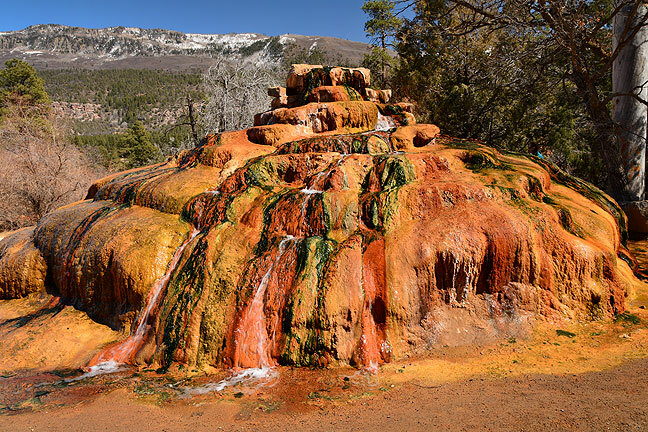 An odd attraction: Pinkerton Hot Spring sits right next to U. S. 550 north of Durango. Like Soda Dam, which Abby and I photographed in 2003, the formation is created from mineral deposits in the spring’s water. Farther north is Engineer Mountain, framed by elegant foothills and lit by dazzling afternoon sunshine. 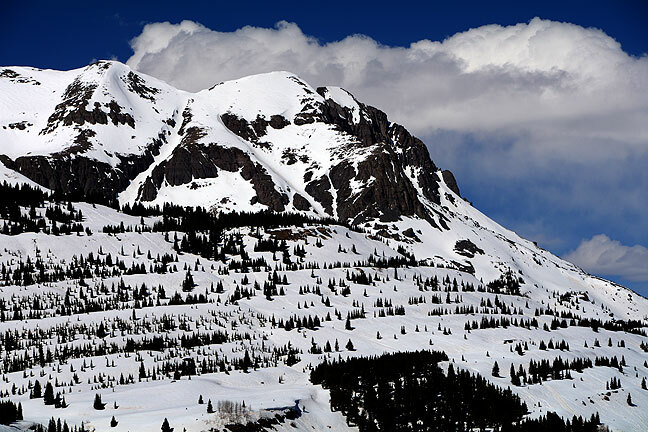 This is another image of the soaring San Juan Mountains I shot as I made my way toward Silverton. 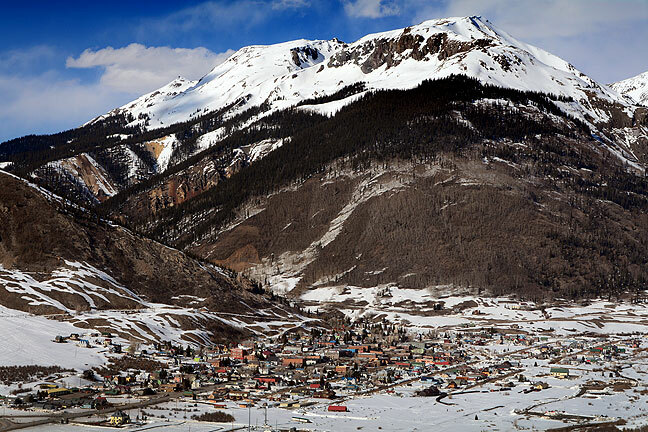 Silverton, Colorado sits above 9000 feet. The mountain light and air create outstandingly clear, beautiful scenes. 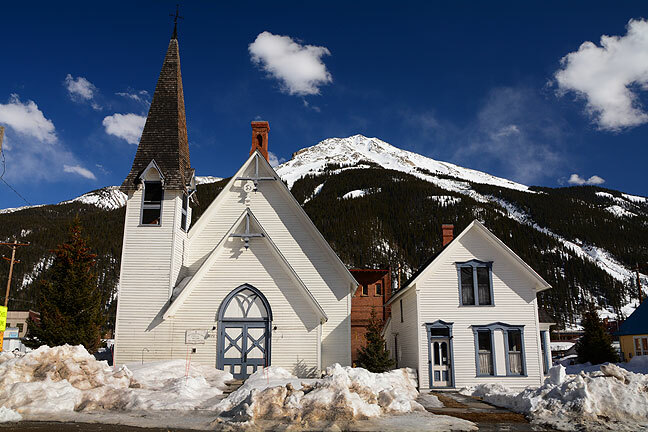 I walked the streets of Silverton for a while, which, because it was between winter ski season and summer tourist season, I had almost entirely to myself, until I found this, the First Congregational Church, built in 1876. This long view shows Silverton looking north from U.S. 550. Up again at dawn, I decided to take the advice of my GPS and follow a different route from Farmington to Canyon de Chelly in Arizona. 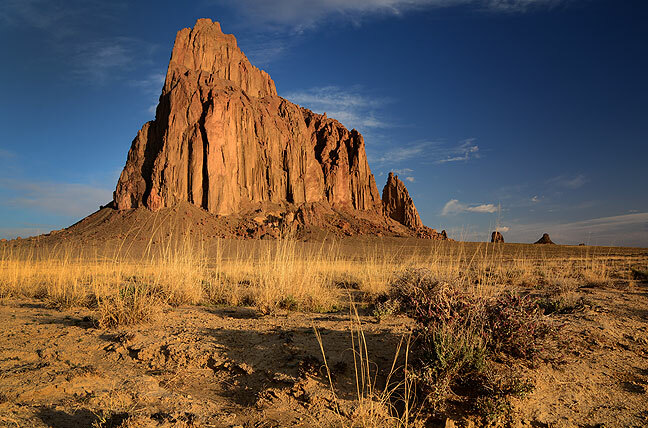 It took me past Shiprock just at dawn, and I decided that since I was in my Nissan Rouge with all-wheel-drive, I would drive the very-rough two-track “road” all the way up to the Shiprock Peak. I had it entirely to myself, and while the light wasn’t magical, I made some interesting images. 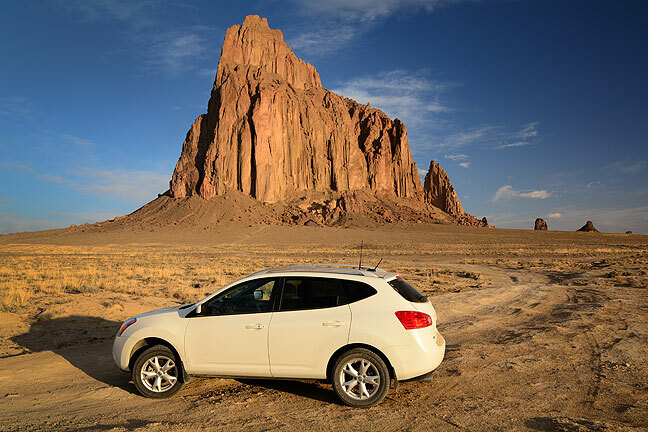 My Nissan Rogue sits at the end of the “road” to Shiprock Peak in far northwestern New Mexico. 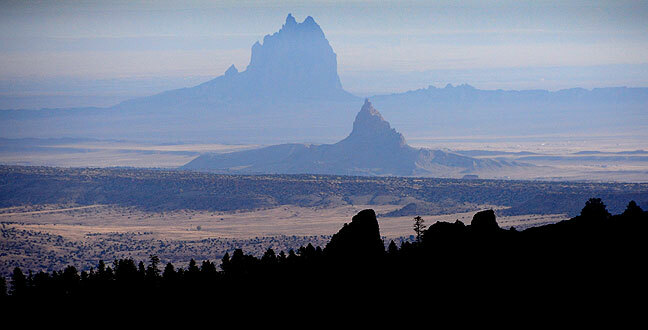 Shiprock Peak, visible for many miles in the Four Corners region, shines at first light. 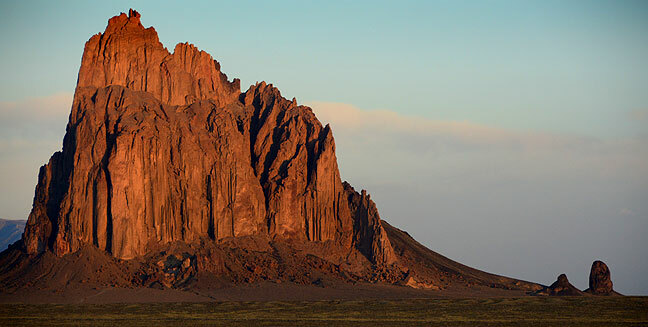 This view of Shiprock was made as I drove closer to the peak, and the sun rose. This view looks down the road from Shiprock back to the Red Rock Highway. 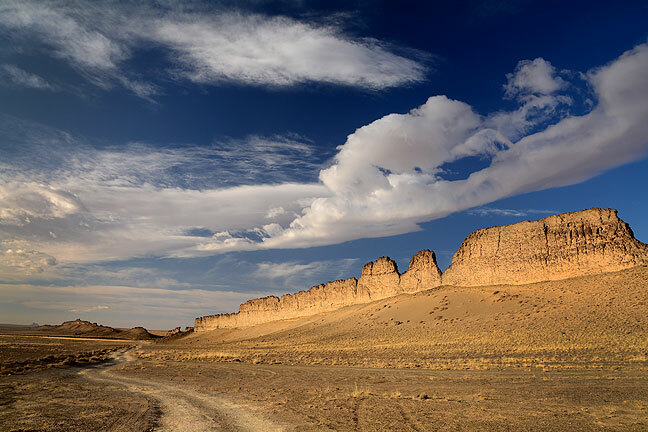 This image, made at Buffalo Pass in the Chuska Mountains just across the border into Arizona, shows Shiprock Peak in the distance. 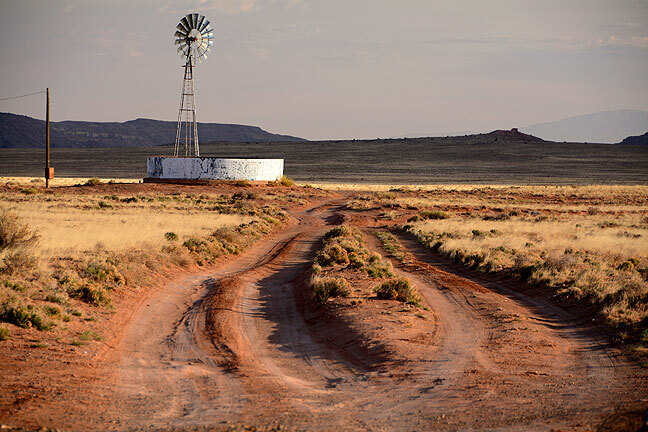 I spotted this road and windmill on the Red Rock Highway west of Shiprock Peak. 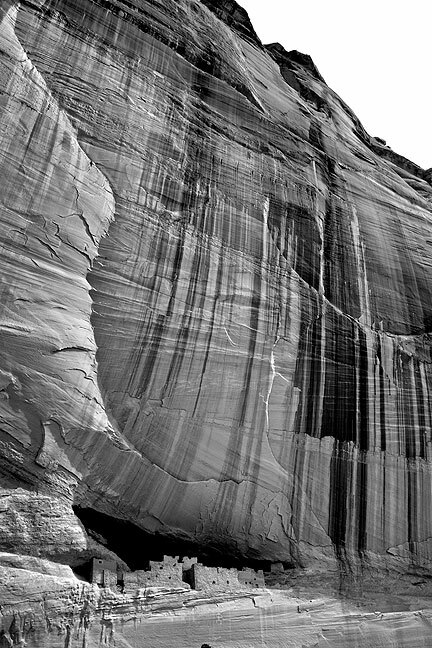 An Australian man did the honor of photographing me at Canyon de Chelly. I bought Abby a lot of neat stuff while I was on the road, but this Navajo Sand Bear, which I got from a vendor at the White House Ruin in Canyon de Chelly, might be the coolest. GPS continued to guide me through Buffalo Pass in the Chuska Mountains just across the border in Arizona. By then, 9 a.m., the wind began to pick up, and got worse as the day progressed. By 10 a.m., I was at Canyon de Chelly. I hadn’t hiked to the bottom to see the White House Ruin since the week I got married, and thought it looked like fun. It was clear and cool out, but the wind continued to be a factor. At the bottom of the canyon, there were several times I had to curl around my camera and wait for the sand and dust to stop blowing around me. Even so, I was there at the right time of day, and made decent images of the ruin and the handsome desert varnish. With dust in my teeth, I hiked back to the top and drove to Spider Rock Overlook, which I had to myself. Fairly dry images due to the harsh midday light. I considered hiring a Navajo guide to take me to other parts of the canyon like Antelope House, maybe even on horseback (which sounds like fun), but the wind deterred me. 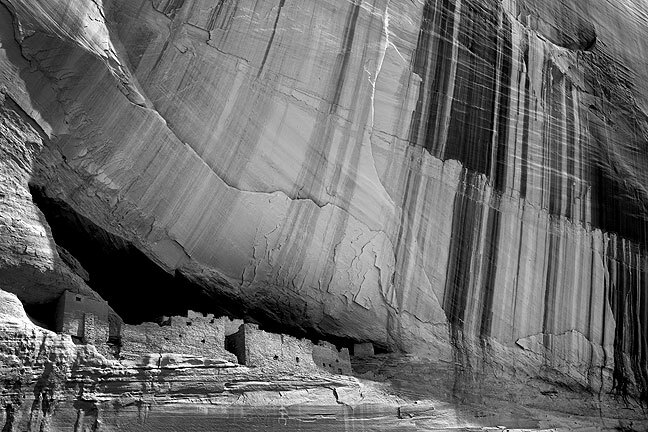 White House Ruin, Canyon de Chelly National Monument; Timothy O’Sullivan photographed this in 1873, which inspired Ansel Adam’s photograph of it in 1942. I first photographed this spot in 2000, then again with my wife Abby in 2004. 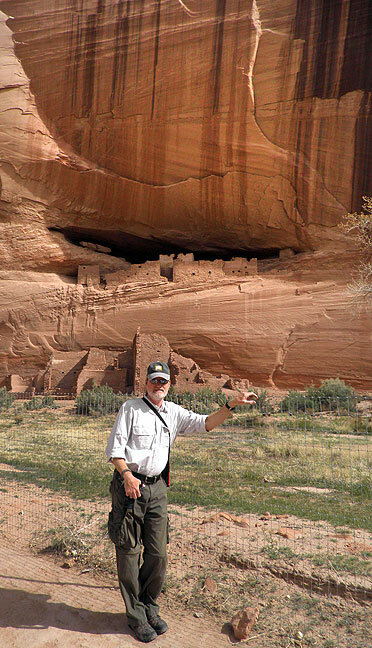 The trail to the White House Ruin at Canyon de Chelly passes through two short tunnels. 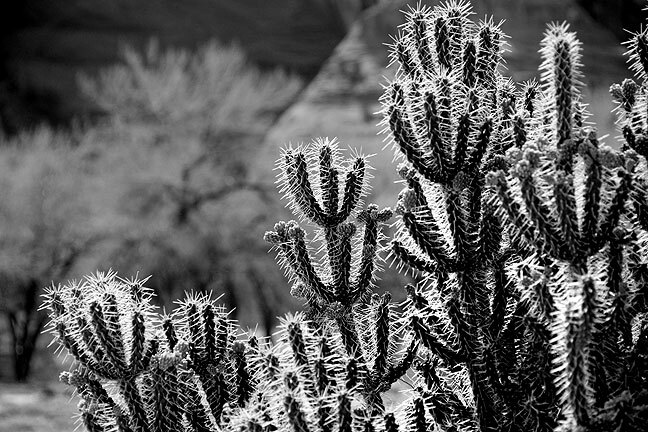 I spotted this nicely-lit bundle of cactus on the way down to White House Ruin. 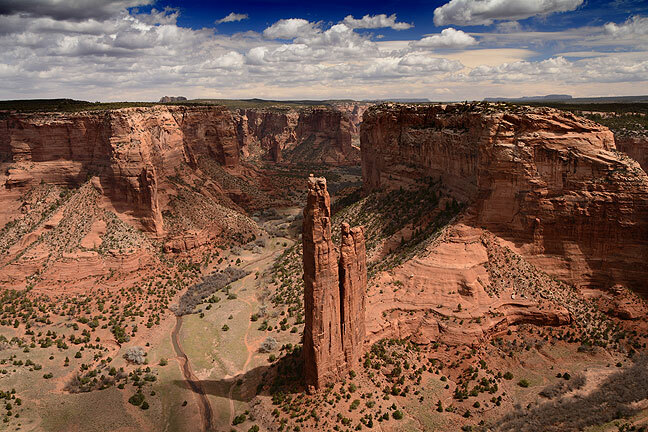 This is a highly-stylized five-image high dynamic range rendering of Canyon de Chelly from the rim. 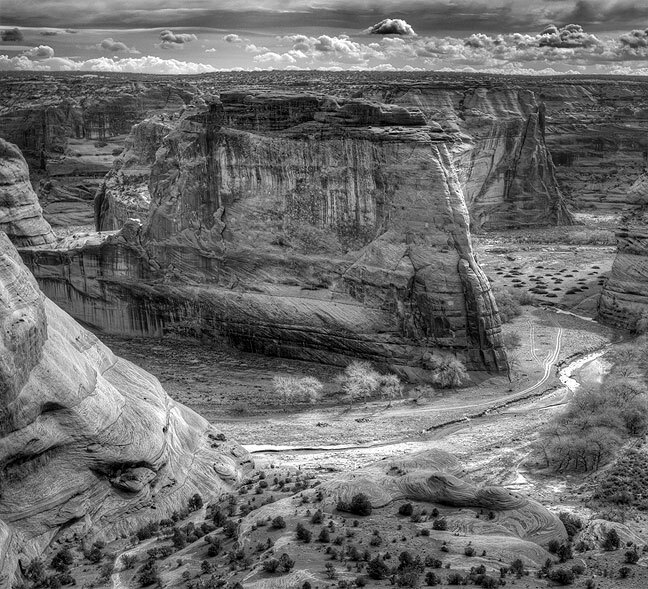 This is the “classic,” and probably most-shot, photograph at Canyon de Chelly. I was particularly happy with this rendition, and have made several very satisfying large prints of it. 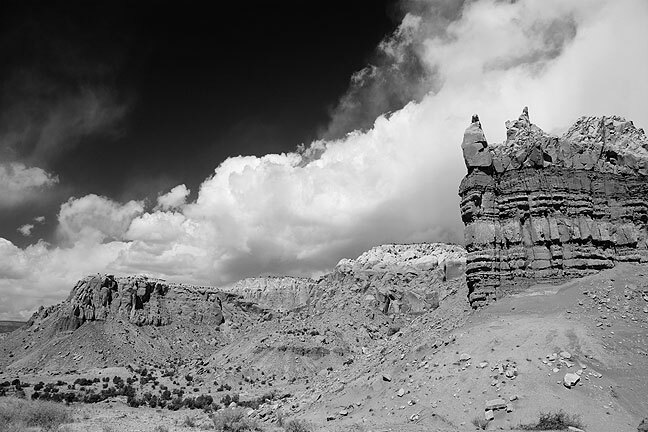 My previous images of this formation, Canyon de Chelly’s Spider Rock, were less successful, but I feel this one captures the vastness of the canyon very powerfully. 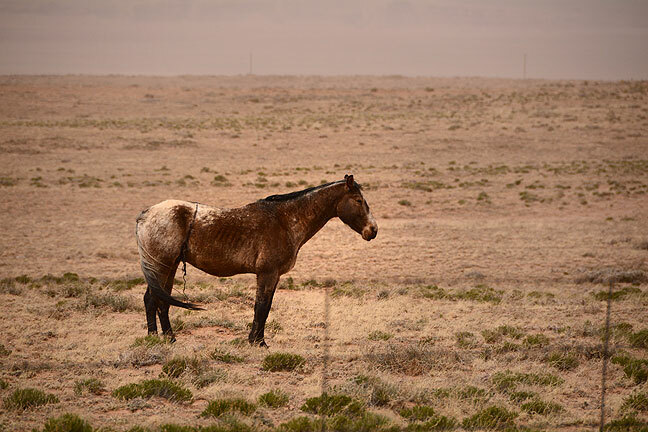 A solitary horse braces against gale-force winds and dense blowing sand and dust in eastern Arizona. By 1 p.m., I got a bite of lunch in nearby Chinle, Arizona, and the wind storm became a dust and sand storm. I drove south and thought about where I wanted to go next. 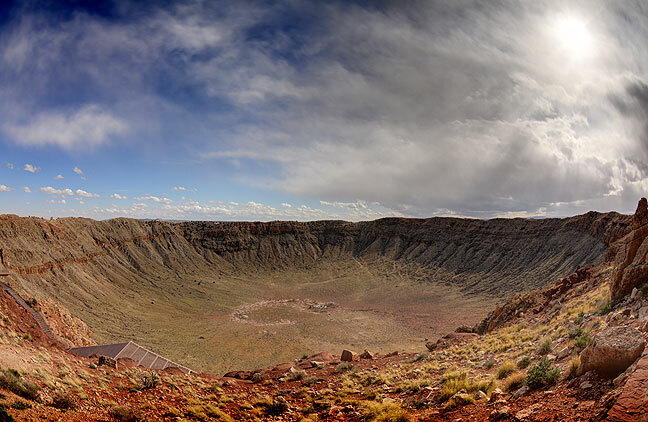 I don’t know why, but before I got to I-40, I remembered that a coworker told me on several occasions that he loved Meteor Crater, which was 99 miles away. I set off toward it, and drove through a nearly-historic windstorm, with Winslow, Arizona reporting 69 mph sustained winds around the time I was there. For most of the drive, sand and dust reduced visibility, and I was concerned that it would ruin the views at Meteor Crater, but about 10 miles from the location, the dust, but not the wind, disappeared. Meteor Crater was interesting, and I’m glad I went to check it off my list, but it made only fair images. The wind complicated matters some, mostly by preventing me from holding my camera steady. Spotting scopes sit mounted on a visitor’s platform overlooking Meteor Crater in Arizona. 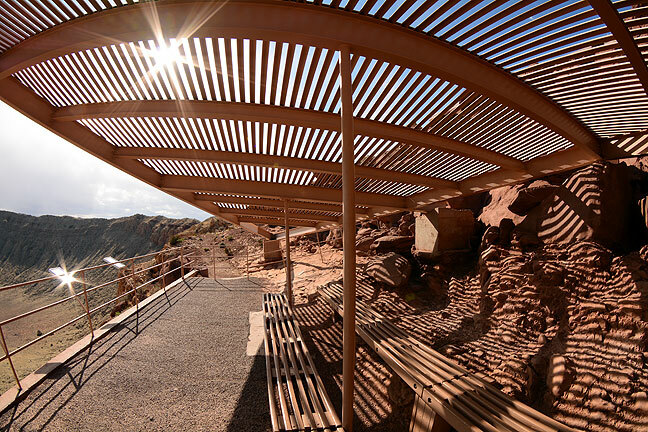 Sunlight streams through a rest area at Meteor Crater’s Visitor’s Center. 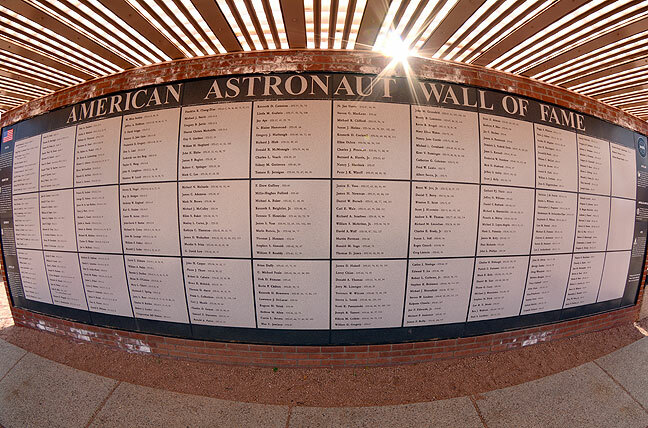 Meteor Crater also features an astronaut wall of fame, since the site was used by NASA to train some astronauts for walking on the moon. 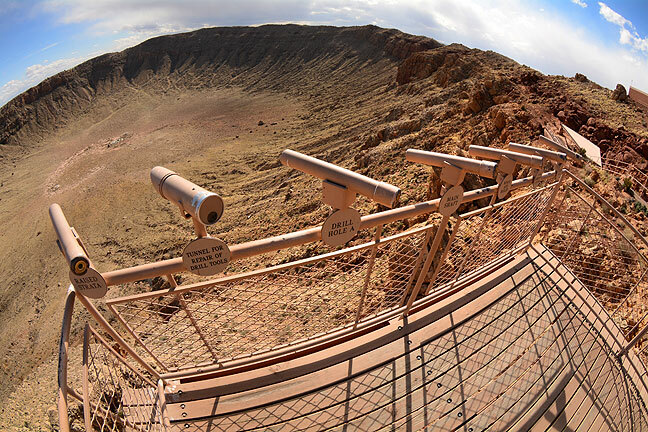 This five-frame HDR fisheye view of Meteor Crater helps convey the sense of the attraction. It was interesting, but didn’t make very many good images. During the night I spent in Gallup, New Mexico, it snowed lightly. 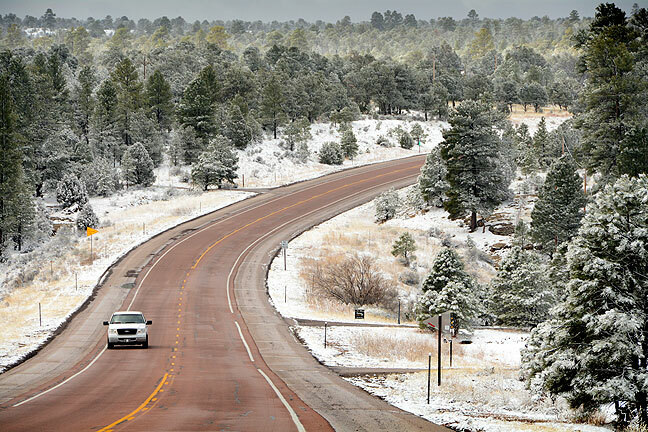 I photographed this delicate scene on New Mexico 602 near Vanderwagen. I wasn’t up as early as I had been, but I was on the road south of Gallup, New Mexico by 8:45 a.m. in time to shoot a dusting of snow on the high tablelands of the area. 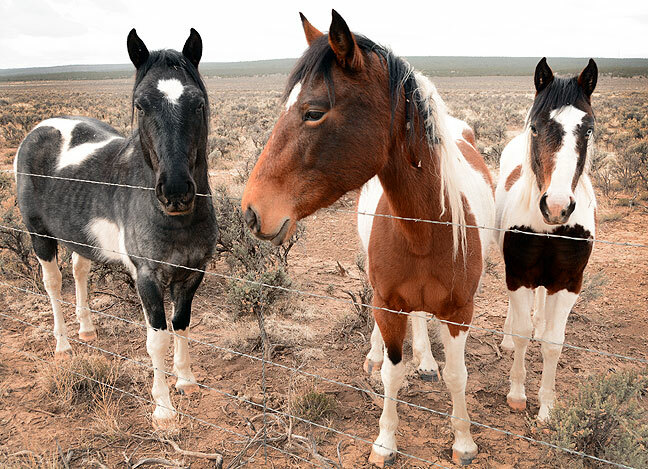 I also stopped and shot three horses, one of which was heterochromic. I photographed these curious horses after driving south out of the snow. The one on the right is heterochromic, meaning it has one brown eye and one blue eye. 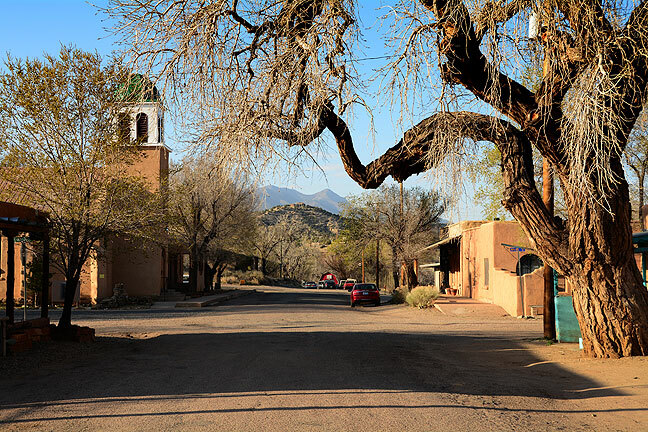 I rolled into Zuni Pueblo a little after nine, not knowing what to expect, having read conflicting accounts on the web. A nice lady at the visitor’s center explained that it was a “preparation day” (though for what, she didn’t say, and I didn’t probe it), so no photography was allowed. I have no problem with native religious ceremony, other than it being just as fatuous as any other religion, because it is a private event on their private property. So I left without making any images. 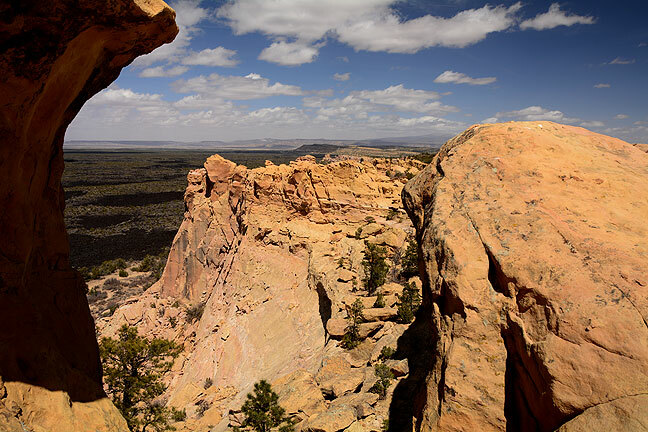 At 10:30 a.m., I arrived at El Malpais (“The Badlands”) National Monument and hiked the El Calderon trail, which ascends a small cinder cone in the middle of a long chain of extinct volcanoes. After lunch, I made my way to the east side of the Monument, where I took time to prowl around the Sandstone Bluffs Overlook, which I hadn’t visited since 2000. 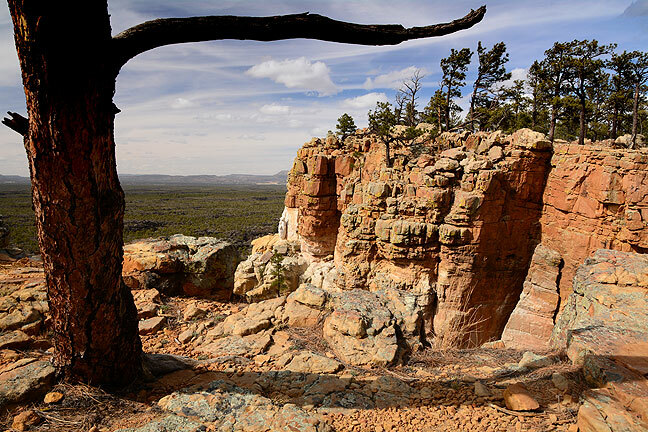 My final stop at El Malpais was the South Narrows Rim trail, which took me high above the vast fields of ancient lava flows into a lush, windswept forested area. I hiked up it to the two-mile marker and back, making nice high-country-light images, and losing myself in the sound of the wind in the trees, and the solitude. 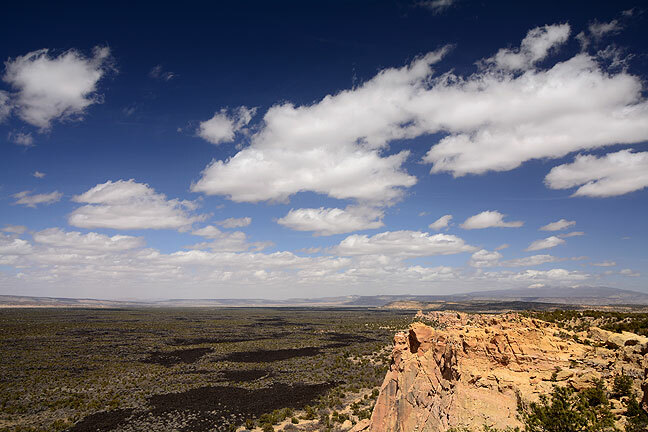 Windblown clouds fill a perfect sky at El Malpais National Monument. 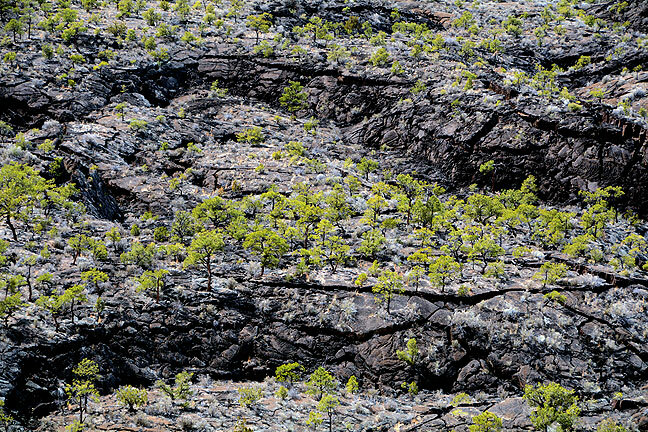 This view from the Narrows Trail shows the nature of the “Malpais,” or badlands, which are composed of a huge lava field from a number of extinct volcanoes in the area. The Narrows Trail at El Malpais leads north from the southern boundary of the preserve. I had this sandstone overlook at El Malpais National Monument, which I hadn’t photographed in 14 years, completely to myself. By dinnertime I was in Albuquerque, where I hooked up with Greg Smith, Michael’s brother-in-law, and Greg’s wife Terry, where they took me to dinner, which was excellent. 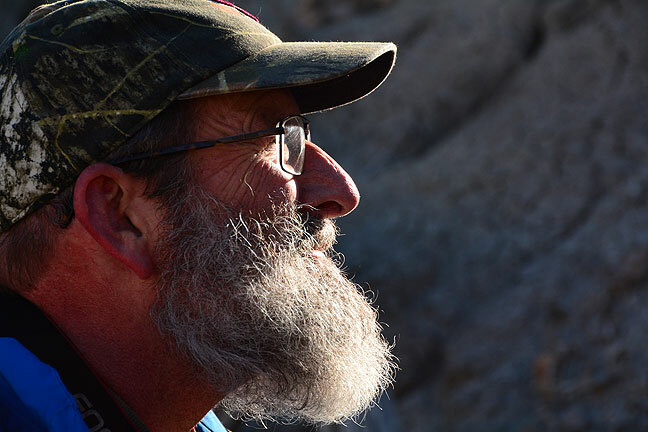 Greg Smith sports an Ansel Adams-esque beard as we started our exploration of the Penistaja Badlands. We approached the high point from the south and departed to the north, allowing us to see more portions of the area. This 12-foot-tall obelisk stood at our rally point for the hike at Penistaja. Greg believed it was constructed in antiquity as a shepherd’s cairn. Greg uses a tripod to make a close-up photograph with his new 100mm Canon macro lens. It was very cold when we started, but the sun was out, and it warmed up nicely. 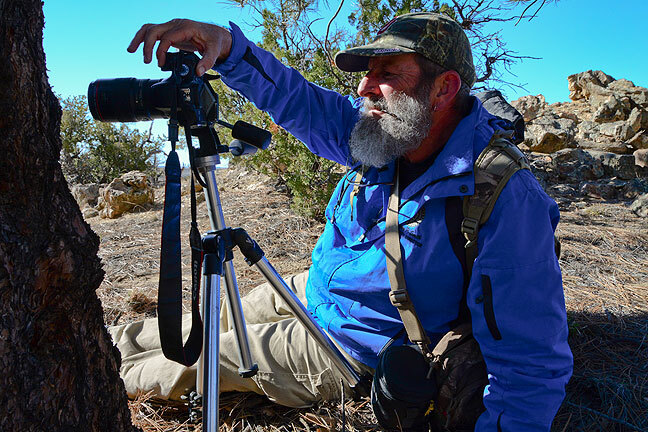 In addition to his interest in photography, Greg is a talented marksman and firearms collector, and is highly knowledgeable about the history of photography. Our conversation seldom ebbed. 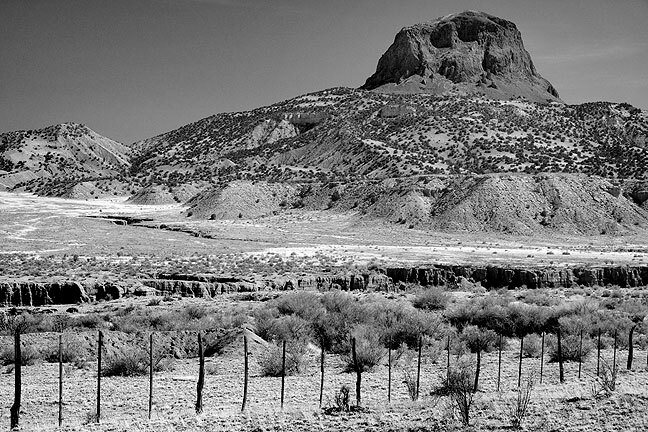 In the afternoon, we took a bleak and desolate road to Cabezon Peak, a large remnant of a volcanic neck that I’ve seen for many years from U. S. 550, but never approached. It made some interesting images, as did the surrounding desert. On my last day of hiking, I hooked up with Greg Smith, a long-time Albuquerque native. 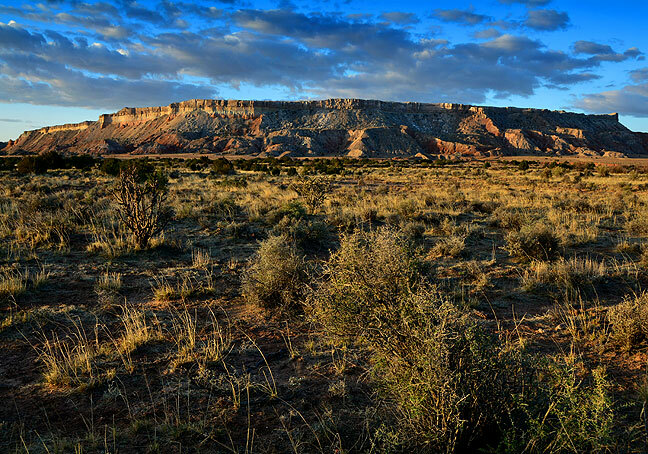 He appreciated by concept of “The Zone,” so he would stop and shoot anything we wanted to shoot, including this early-light vista of Mesa Prieta along U.S. 550. 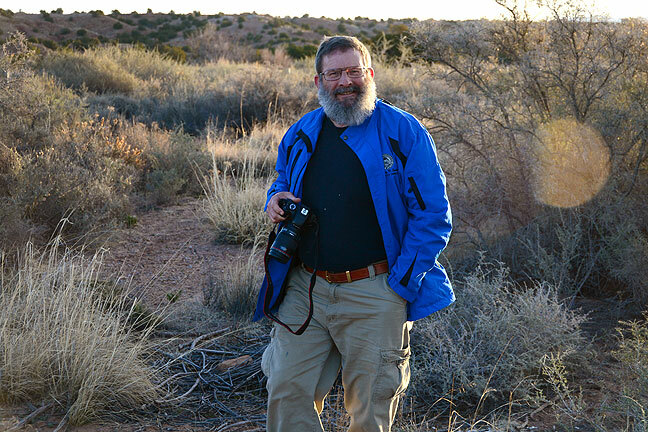 Greg smiles as we photograph first light along U.S. 550 near Cuba, New Mexico. 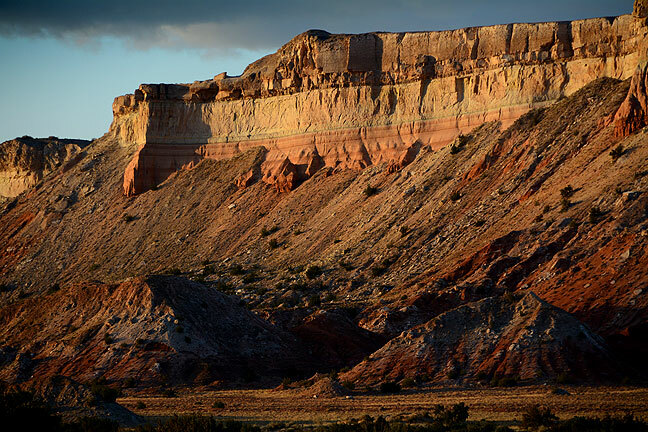 Morning light shines on the long, elegant Mesa Prieta near San Ysidro, New Mexico. 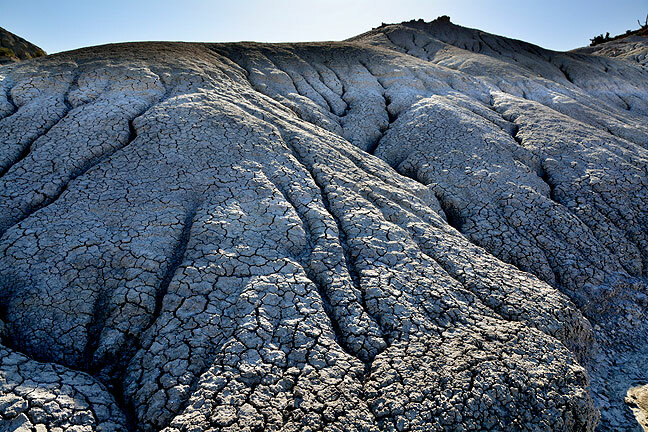 Our hike at the Penistaja Badlands featured a huge amount of variety, as well as high-desert features like this erosion we photographed early in the morning. A long-dead tree sits on a bleached cliff face above the wash in which we hiked at Penistaja. 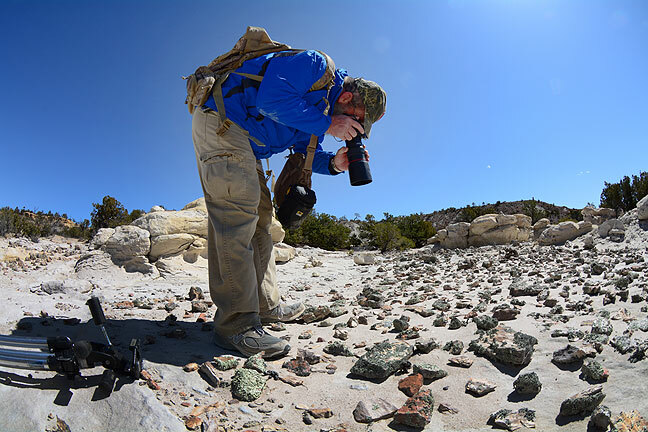 Looking a bit like an astronaut photographing a distant planet, Greg makes macro images of the geology of Penistaja. I made this very serious-looking self portrait with my fisheye lens near the end of our Penistaja hike. Greg and I dubbed this formation, which is about ten feet tall, “The Ghost of Penistaja,” though neither of us could remember the Spanish word for ghost. It is either phantasma, espectro, or espíritu. 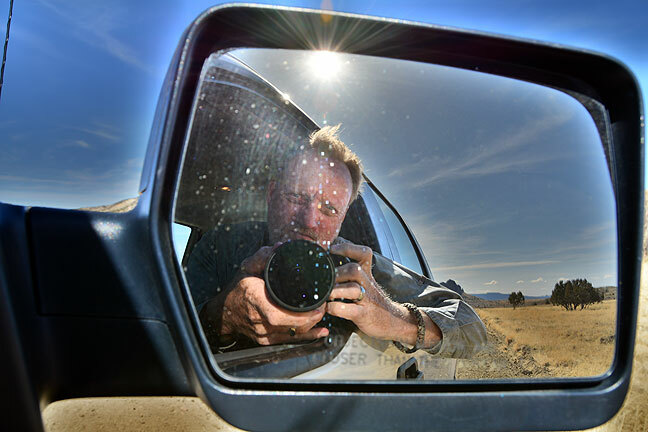 As we drove the lonely road toward Cabezon Peak, I made this pensive self portrait in Greg’s mirror. 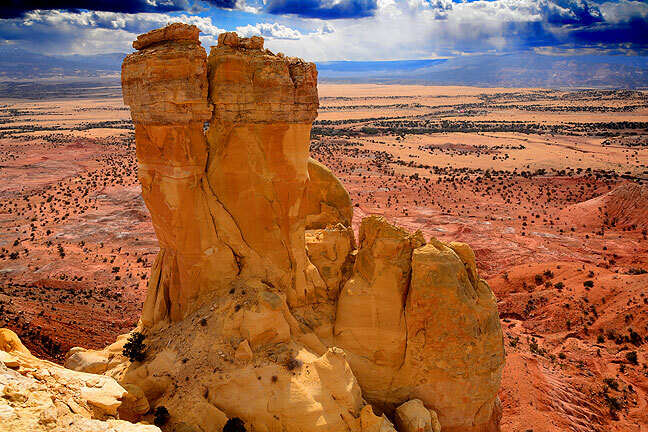 Cabezon, derived from the Spanish word for head, Cabeza, dominates an otherwise bleak landscape. 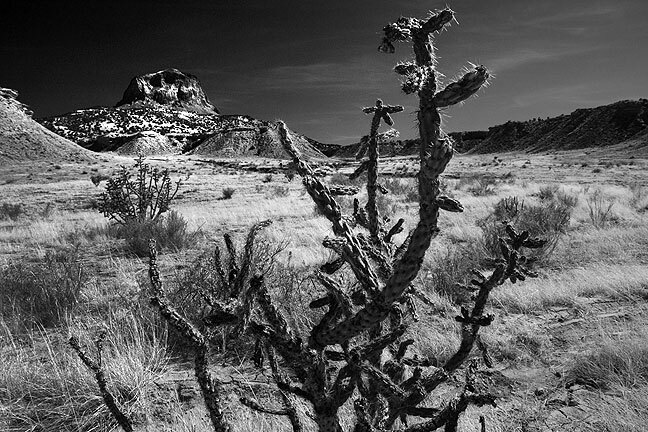 Cholla creates a natural compositional element for this image of Cabezon Peak. 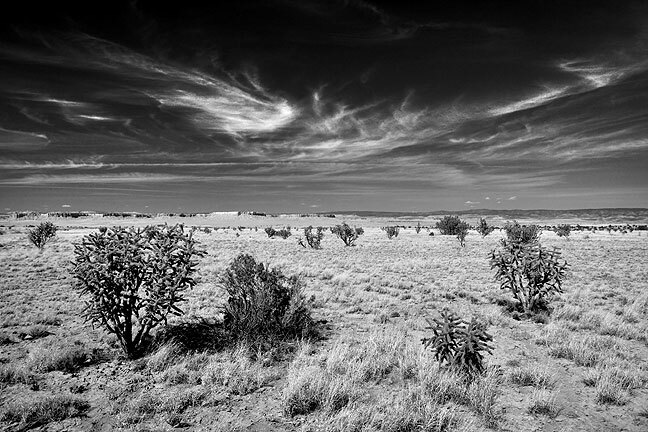 This image, made near Cabezon Peak, seems to convey the essence of the high desert of New Mexico. 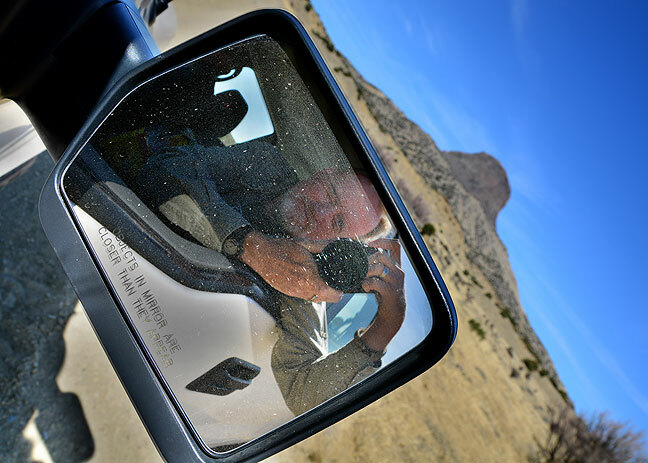 I made this outside-the-box (for me) self portrait in Greg’s side mirror near Cabezon Peak. 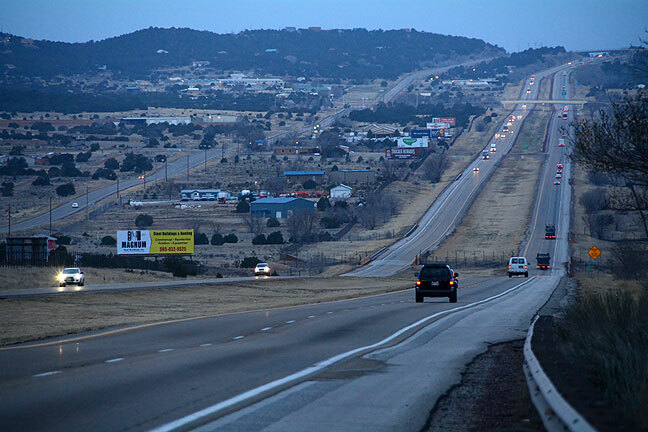 By evening, I headed east, ending up staying the night in Santa Rosa, New Mexico before driving home Saturday, March 29. 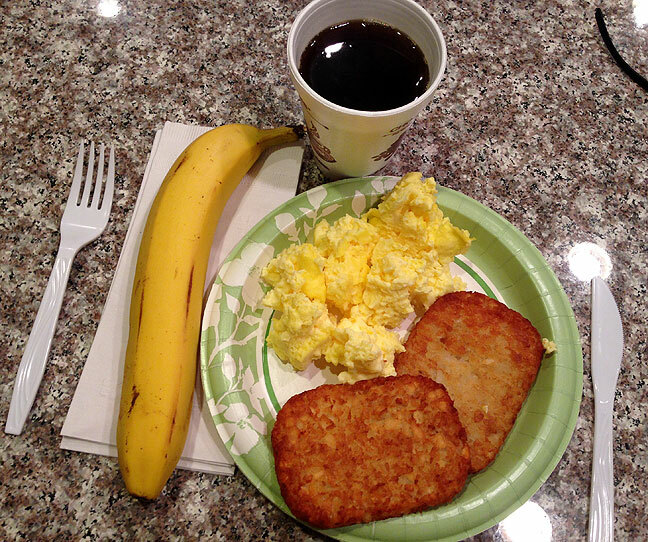 This was breakfast at Comfort Inn at Farmington, New Mexico. It was well-cooked and featured good variety and nutrition, which is a far cry from 10 or 15 years ago. 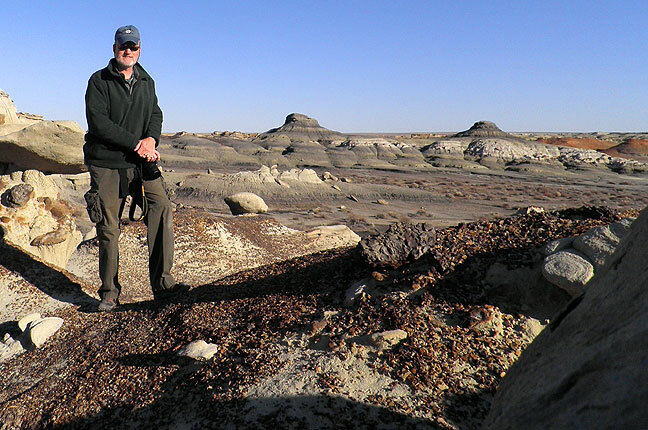 The name of this trip, “My Two Cents,” refers to the two pennies I found while hiking in the Bisti Wilderness. 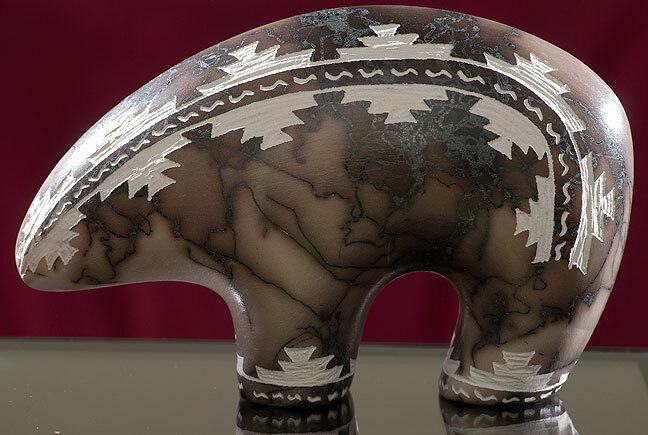 I bought something for my wife Abby pretty much everywhere I went, with preference to native traders. I saw a guy at Molas Pass with a Nikon D800 who clearly didn’t know how to use it. Motel breakfast has evolved in the last 15 years, and is now pretty good. On the trail with Greg, he carried his .45 caliber 1911 pistol, and I carried my Ruger LCP. I had most of my hikes entirely to myself. Starting on day three, I was “calfsore,” meaning that the muscles in my lower legs and feet were sore in the morning from long hikes on loose, rough or steep terrain, until I got back on the trail and loosened up. “Calfsore” is one of my favorite feelings. Observation that I am in reasonably good shape: after exertion, I recover very quickly upon resting. This tour was the trial-by-trail for my Nikon D7100 and the AF-S Nikkor 18-200mm f/3.5-5.6, and both proved to be outstanding choices as lightweight, versatile equipment for travel and hiking. 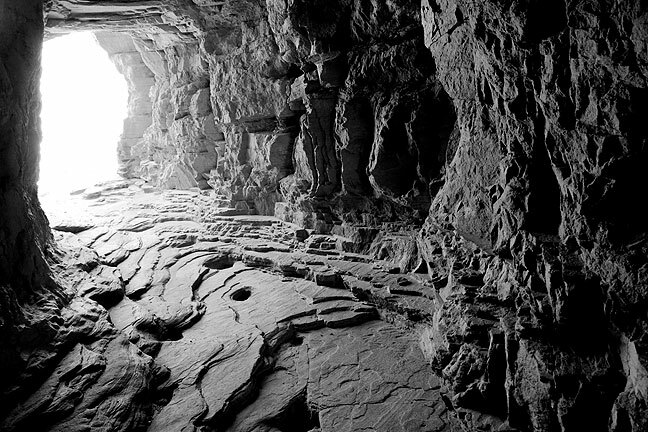 While I shot all images in color, many of the images posted in this trip report were better expressed in black-and-white. I experimented with in-camera high dynamic range (HDR), and some images rendered well using this technique. 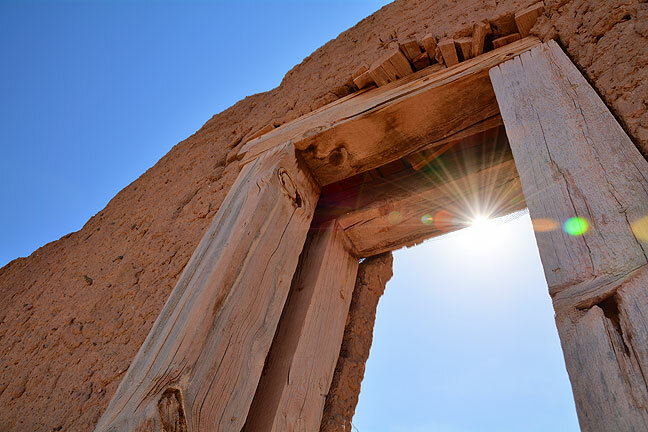 Afternoon sun shines through a doorway at the Santa Rosa de Lima Church ruins.